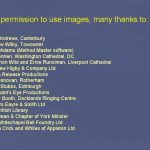 With acknowledgement to the Association of Ringing Teachers for much of the core material, as well as the working group led by Caroline Stockmann: David Gambling, Mike Gander, Stuart Holtham, Helen Horn, Martin Jones, Rosalind Martin and Milica Reardon. We hope you might also find this guide to an open tower day useful Running a successful Tower Open Day v6 , with thanks to Margaret Bale and friends, as well as this example poster from Brisbane BrisbaneBellPoster. 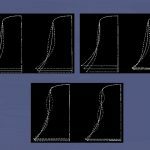 Below images are derived from a PowerPoint presentation. 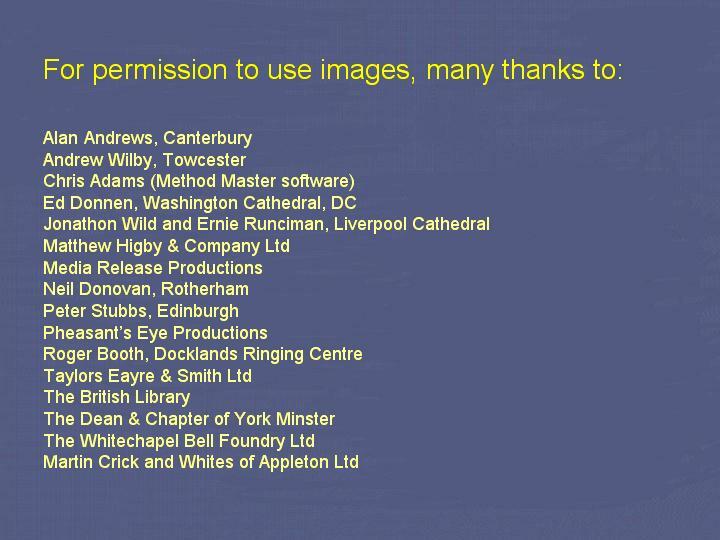 They may be freely used for ringing educational and publicity purposes provided that the acknowledgements slide (or its wording) is also shown. 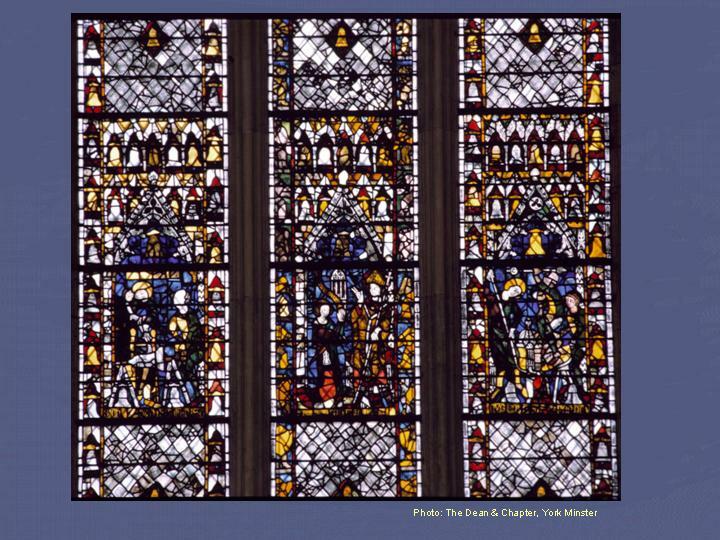 The Bell Founder’s window in the north nave aisle of York Minster is a unique mediaeval depiction of the craft of casting a bell. 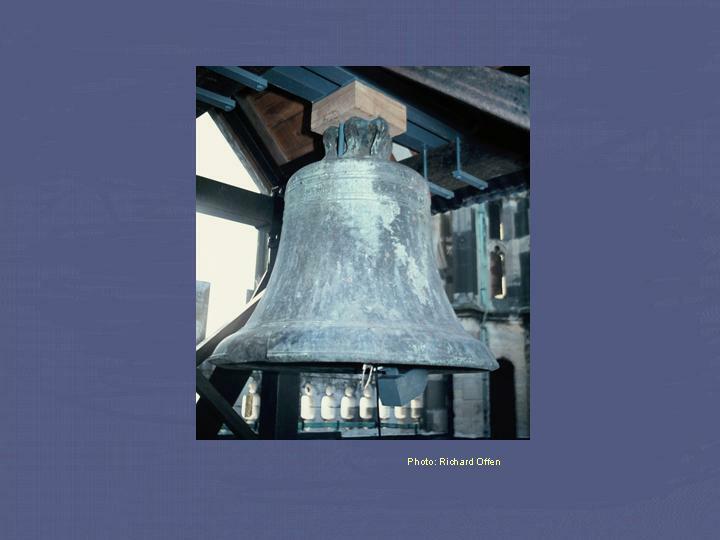 It was given to the Minster by Richard Tunnoc, a York bell founder who died in 1330. 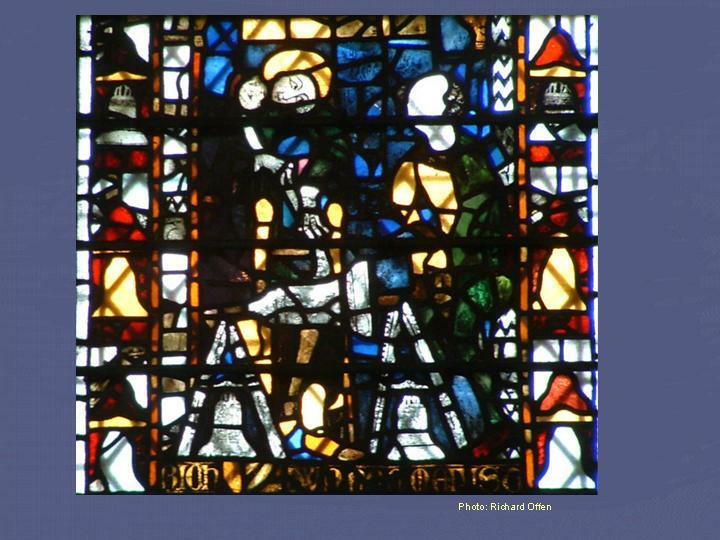 This panel of the Bell Founder’s Window depicts the founder forming a wax ‘false bell’, in the exact shape of the bell he is going to cast. 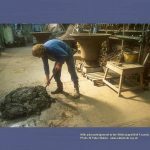 When the mould is completed, the wax will be melted out leaving a void into which the molten bell metal can be poured. 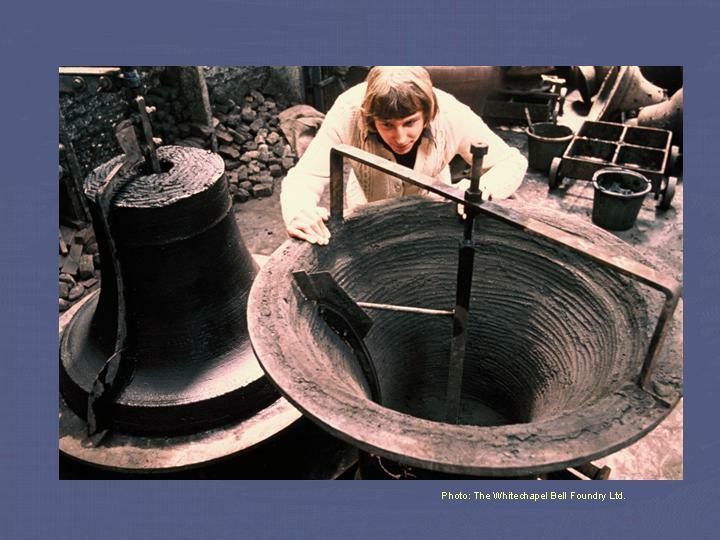 This slide names the parts of a typical church bell – the one in the photo was cast early in the 14th century. 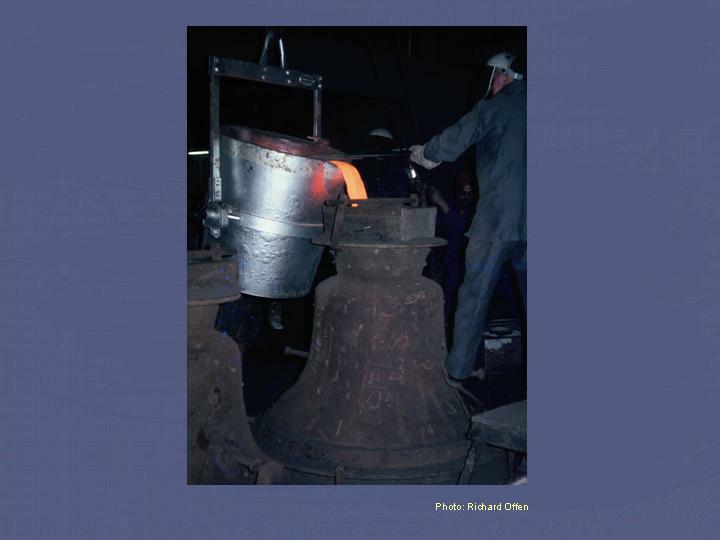 To cast a bell, molten bell metal is poured into a mould, which is made in two parts: an inner mould, or ‘core’, and an outer mould, known as the ‘cope’. The manner in which church bells are manufactured in England has changed very little over the last thousand years. 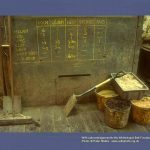 The moulds are made out of a traditional moulding loam consisting mainly of a mixture of clay, cow dung and horse hair. 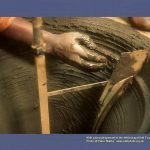 The ingredients are carefully mixed together to form an homogenous and fairly stiff ‘mud pie’ which can be built up into the required shape. 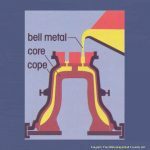 The ‘core’, or inner mould, is built up in layers on a metal base plate and contoured to the bell’s profile using a metal plate, known as a ‘strickle’, shaped to the required profile of the bell. 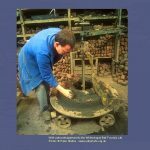 Each layer of the moulding loam is slapped on top of the previous layer and carefully smoothed in, ensuring that no air pockets are left in the finished article – they could expand and burst the mould when the hot metal is poured into it. 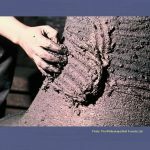 The strickle is revolved around the mould, paring off excess loam and shaping it to the required profile. 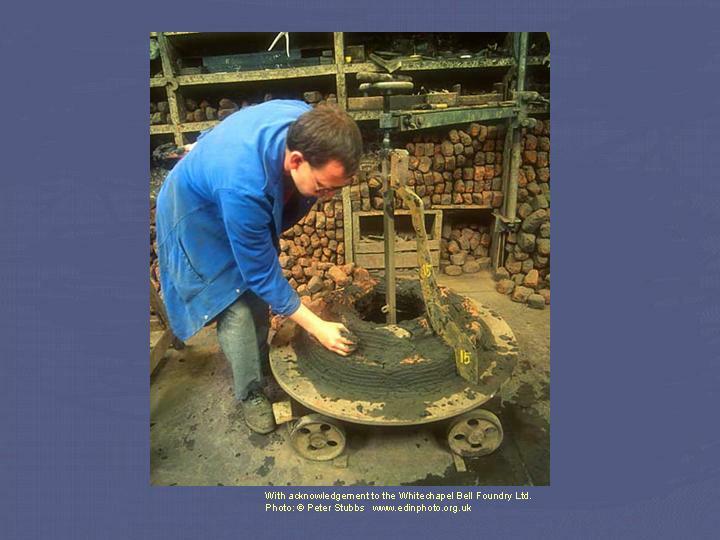 Once a number of layers of loam have been applied, the mould is placed in a drying oven to bake hard. 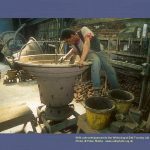 It is vital that no moisture remains in the moulding material at the time of casting. 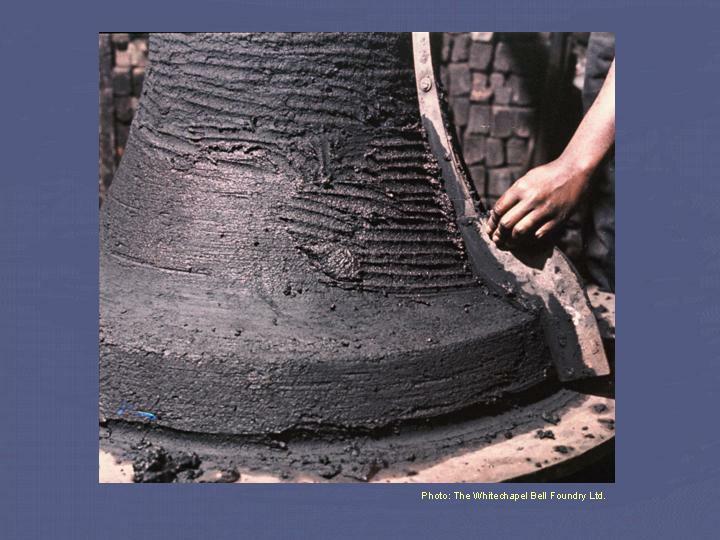 The ‘cope’, or outer mould, is built up inside an iron case, resembling the shape of a bell. The many holes allow loam to exude through them and thus ‘key’ the moulding material into the cope. As with the core, moulding loam is built up on the inside of the cope to form the shape required. 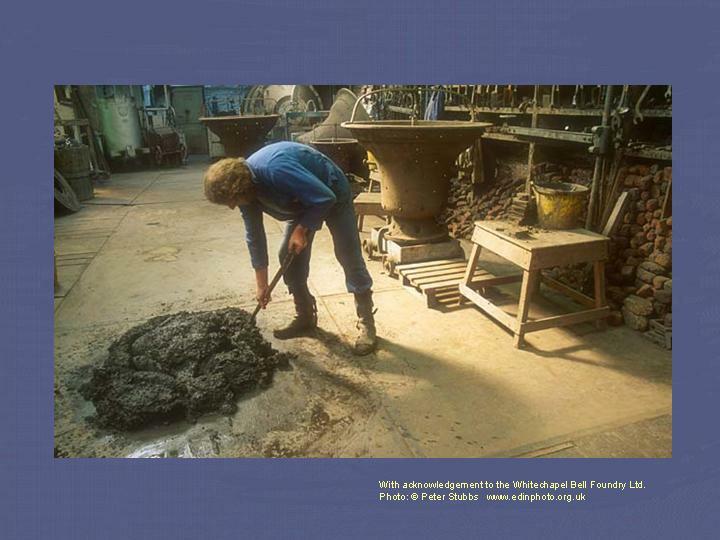 The mould is placed in the drying oven at regular intervals. The strickle, which has now been inverted, is once again used to remove surplus loam and form the required shape. 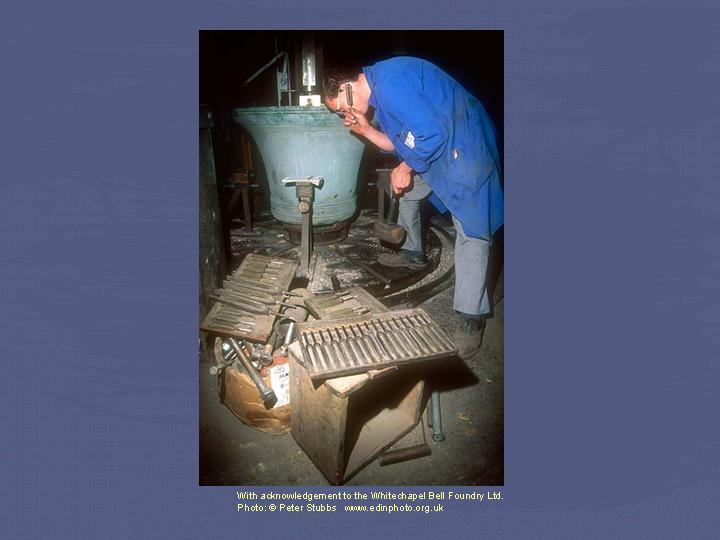 This photograph shows the two components of a bell mould nearing completion. 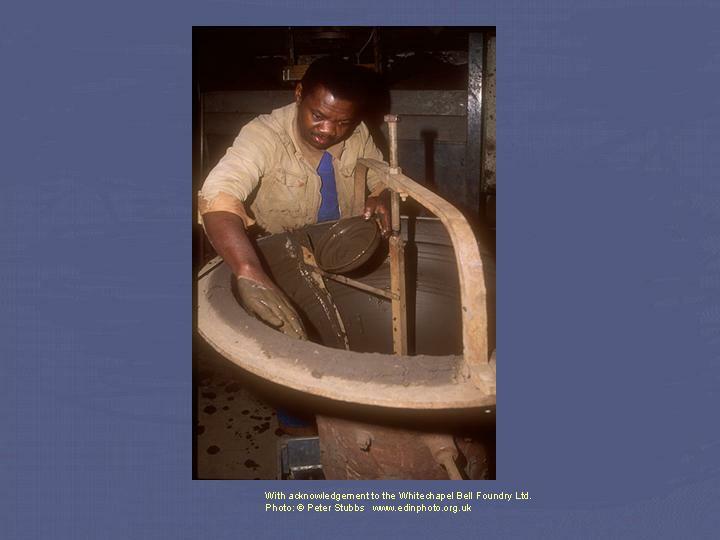 In order to achieve a fine, smooth finish to the moulds, the final layer of loam is applied as a wet slurry. 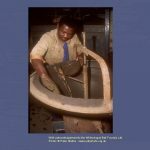 Before the final layer of moulding material has been baked hard, the mould is coated in graphite (this prevents the molten metal from burning the moulding loam) and any inscription or decoration is stamped into the mould in reverse. These indentations provide a reversed relief inscription on the finished bell. Bell founders have always delighted in decorating their bells with ornamentation and lettering. 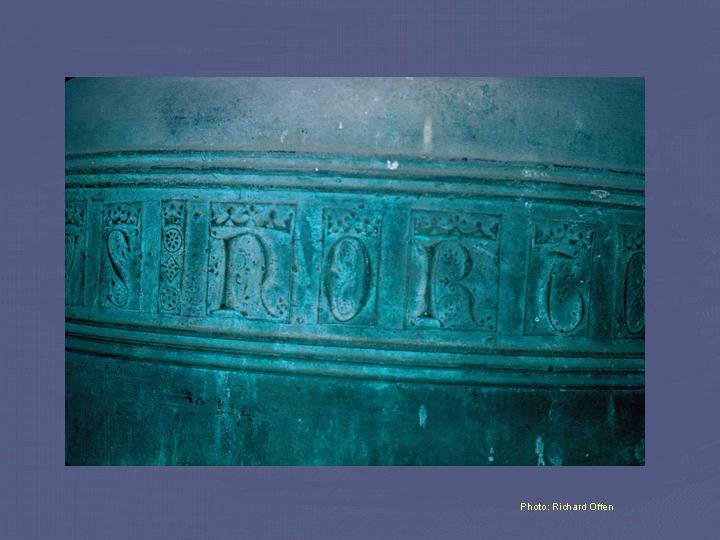 Some bells have an inscription that simply records the founder’s name and year of casting, others refer to the many superstitions surrounding the use of bells – one bell in Oxfordshire simply has “SAVE US” inscribed on it! 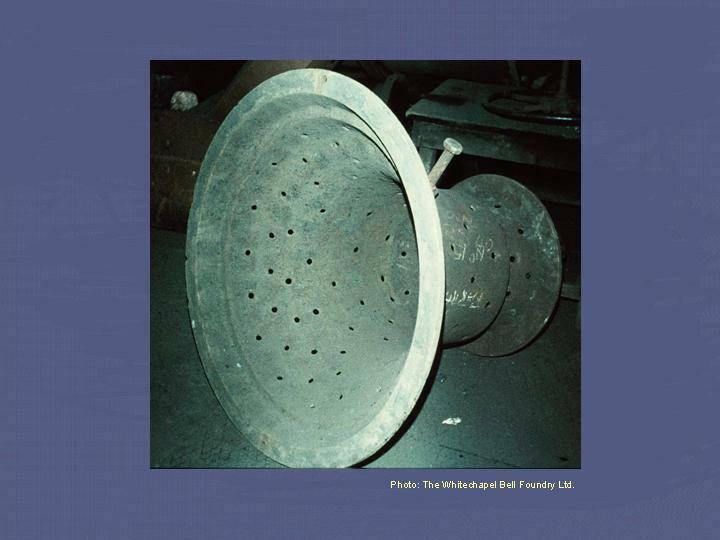 During the eighteenth century doggerel verse was popular on bells: the Whitechapel Bell Foundry frequently inscribed its treble bells with the verse “I MEAN TO MAKE IT UNDERSTOOD THAT THO I’M LITTLE YET I’M GOOD”. 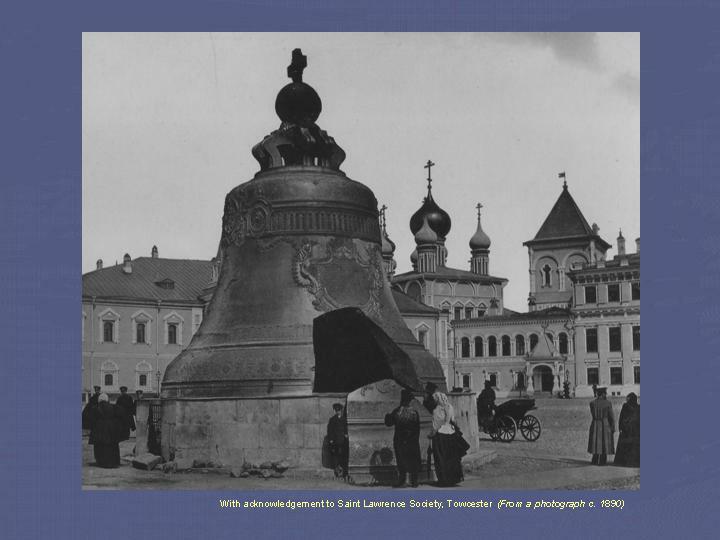 Another inscription sometimes used on tenor bells is: “TO THE CHURCH THE LIVING CALL – TO THE GRAVE DO SUMMON ALL”. 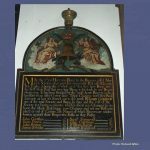 The bell illustrated was cast in the fourteenth century for Snave church on Romney Marsh in Kent. Its founder, Stephen de Norton, used beautifully decorated letters and stops to record his name. Once both moulds are thoroughly dry and hard, the cope is inverted (thus the necessity for the holes for the loam to key to!) and carefully lowered over the core. 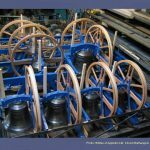 It is important that the bell founder ensures the cope sits absolutely centrally over the core to ensure that the bell is of concentric shape – any variation in thickness from one side of the bell to another will spoil the tone of the finished product. 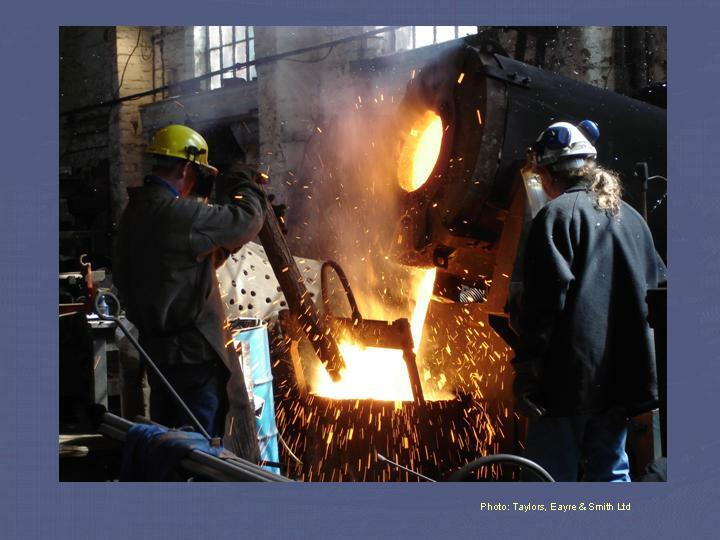 Bell metal is an alloy of 77% copper and 23% tin, which is heated to about 1,100°C. 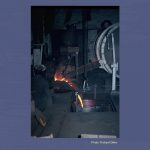 When the metal is molten, more tin is added to compensate for that which burns off during the melting process, and the metal is run off into a ladle, or ‘shank’, ready to be poured into the waiting mould. 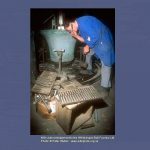 When pouring the molten metal from the furnace, various methods can be used to ensure that the bell metal is free from impurities which might spoil the casting. 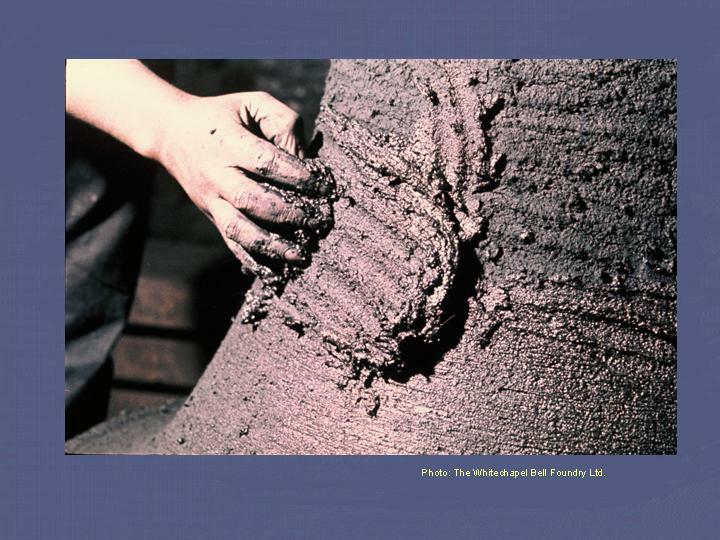 A traditional method, still in use, is to dip a willow branch into the molten metal. 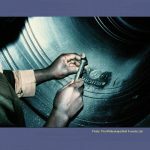 This helps to ‘de-gas’ the metal and cause various other elements to ‘burn off’. 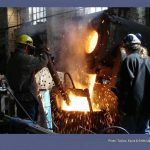 The metal is poured into a hole at the top of the mould and gases formed are allowed to escape through a further hole. 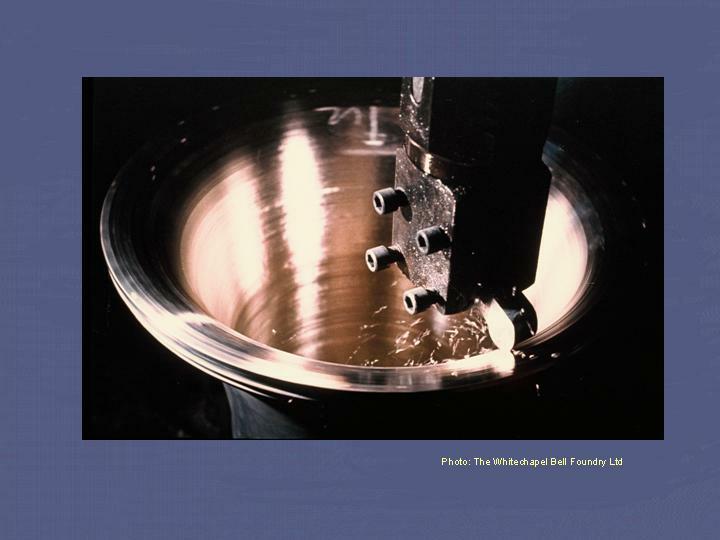 Cooling is carefully controlled to prevent stresses within the metal which could lead to future cracking. Large bells can require up to a week to cool. 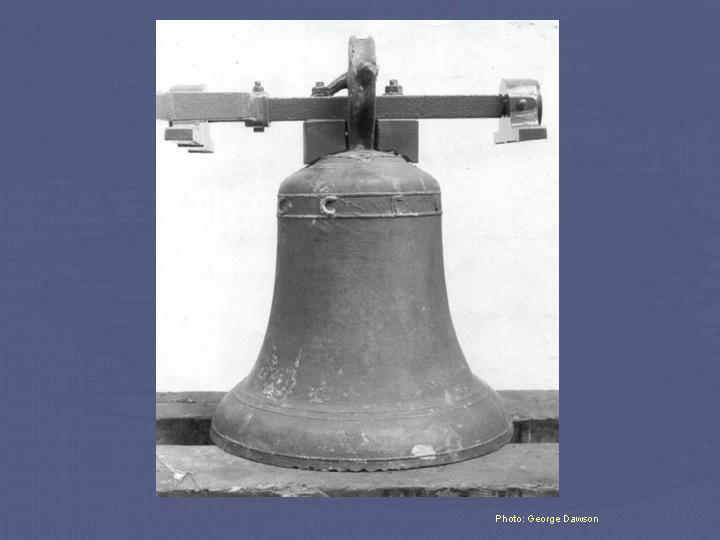 The sound a bell makes is a complex function of its diameter, weight, profile and thickness.  Every founder down the ages has striven to achieve his own idea of perfection of tone. In the early days each founder had his own favourite bell profile, which had evolved to produce his own idea of perfection of tone. 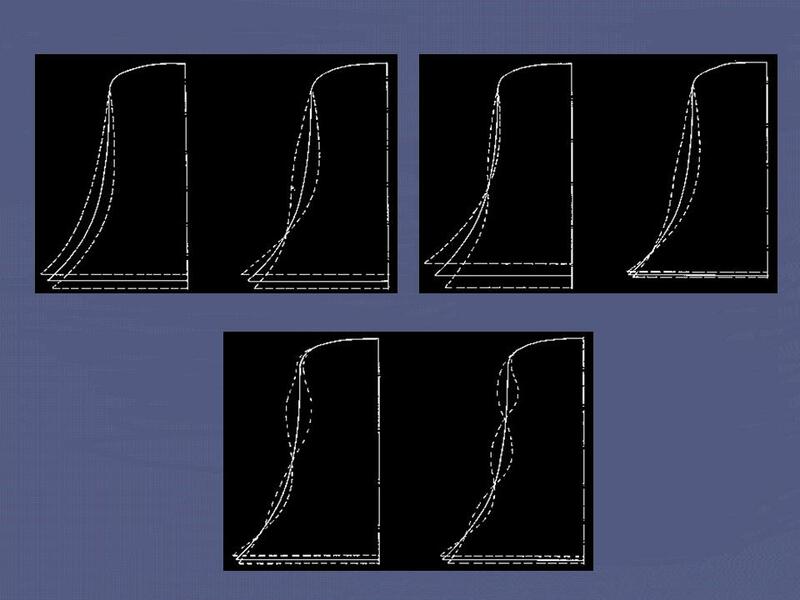 The bell profiles in this diagram show the evolution of the shape of a bell from the 13th to the 19th century. 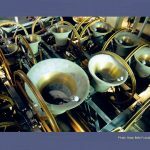 Because of the complex shape of a bell, when it is sounded we hear a combination of notes which come from different parts of the bell vibrating at different frequencies. 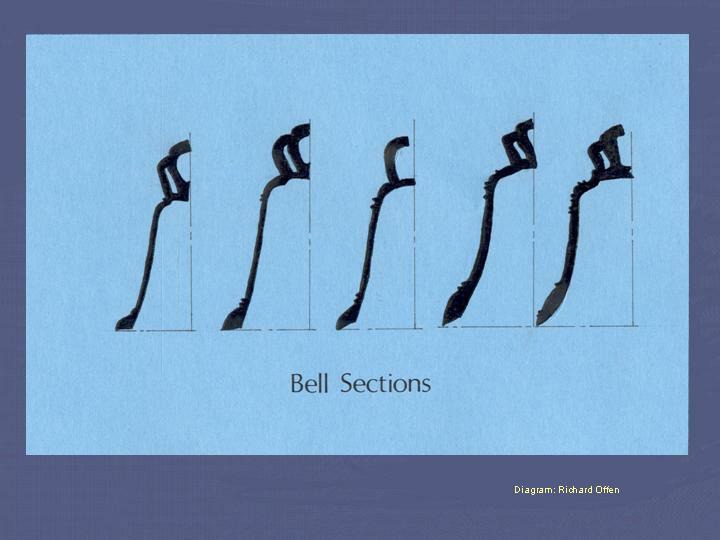 These ‘partial tones’ combine to give the bell its characteristic tone. 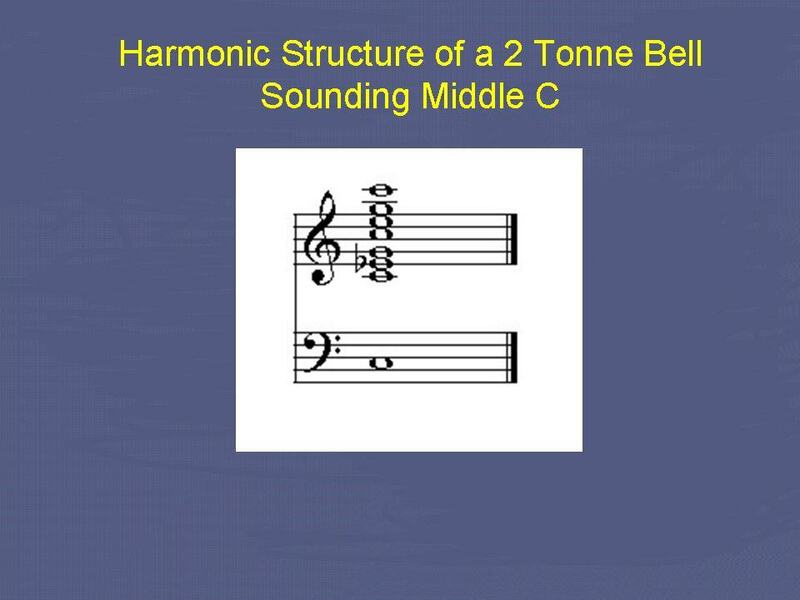 The main partial tones of a bell weighing 2 tonnes and sounding middle C on the piano can be shown in musical notation as the chord in this diagram. 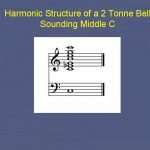 Compared with many other musical instruments, the harmonic structure of a bell is extremely complex. 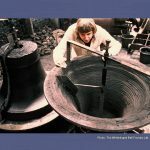 Until the 19th century, any ‘fine tuning’ required by a new bell had to be done by chipping pieces of metal off the inside surface with a hammer. 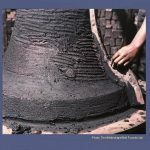 This was a very imprecise technique, and could result in the bell being cracked by overzealous blows! 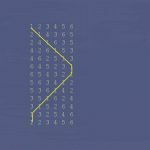 During this rudimentary tuning process, progress was usually monitored by means of comparison with a violin or pitch-pipe. 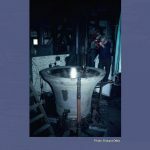 This photograph shows clearly the furrows left in the bell’s surface by chip-tuning. Above these furrows can also be seen the marks left by more recent machine tuning. 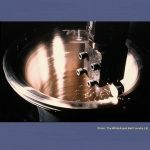 An improvement came with the application of lathe technology to bell tuning. 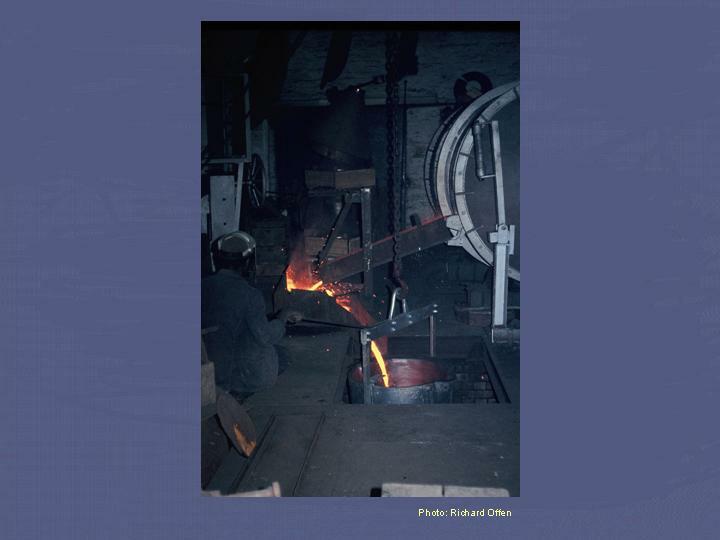 This engraving shows the tuning machine employed by the Rudhall foundry in Gloucester. 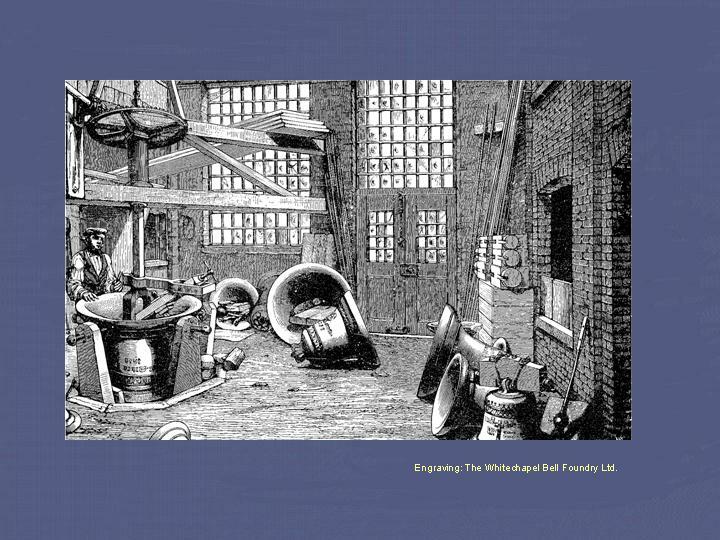 The machine was later moved to Whitechapel when the Gloucester firm was taken over. 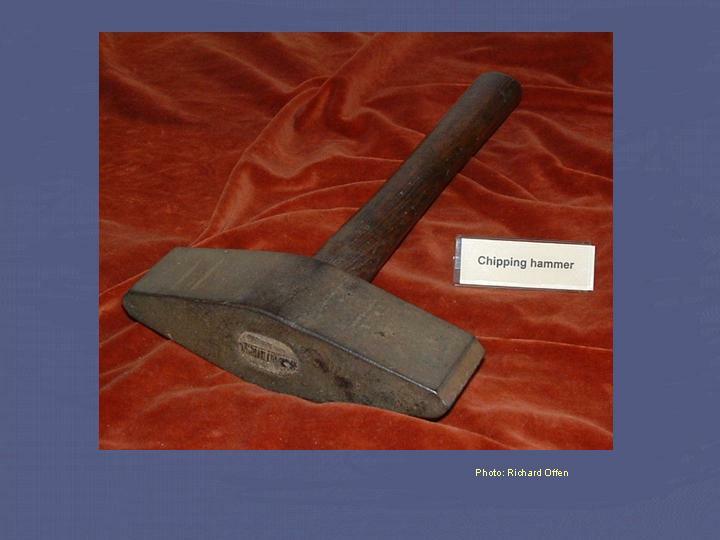 Note that unlike modern boring mills, the cutting tool revolved around the bell, rather than the bell around the tool. 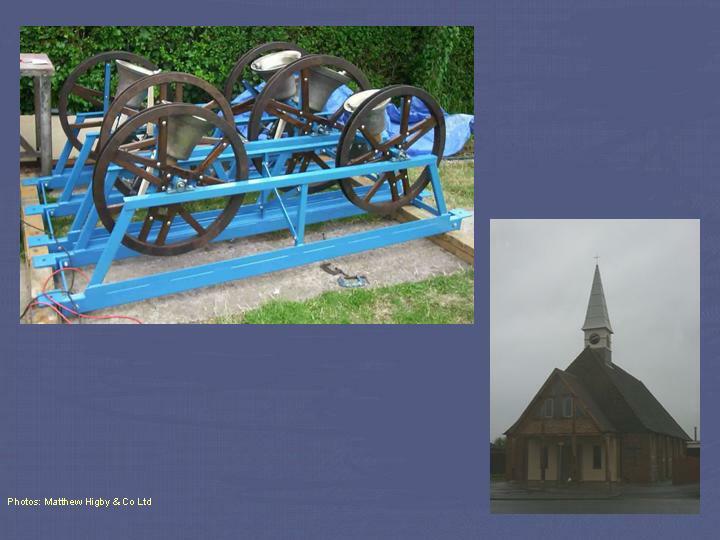 The machine was originally powered by a donkey, but was later converted to steam power. 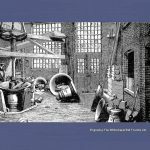 In the 17th century, a bell founder in Holland, Pieter Hemony (1619 – 1680), discovered the art of ‘harmonically’ tuning bells by cutting metal off the bell’s inside surface on a large lathe. 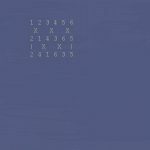 This enabled him to alter the frequency of the individual ‘partial tones’ of a bell, thus bringing them into a musical relationship. 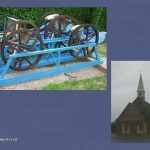 So closely guarded was his tuning secret that it died with him, although some very fine examples of his bells are still in use in Holland today. 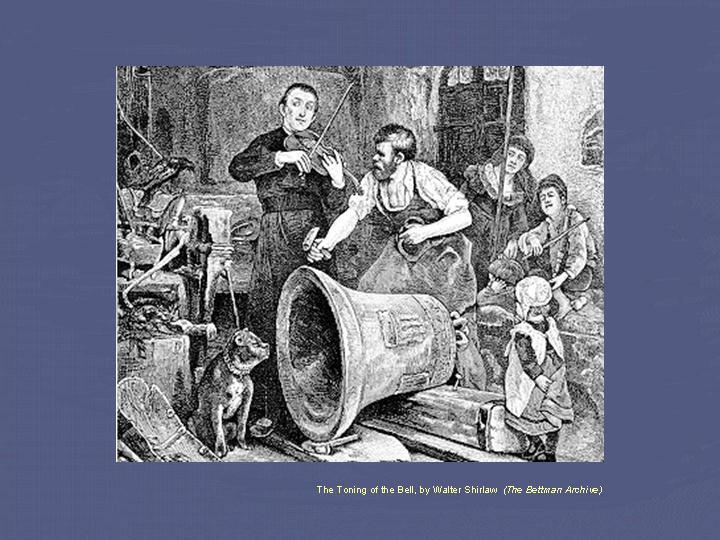 The bell shown on the tuning machine in the photograph is Great Dunstan, of Canterbury Cathedral. This bell was cast in 1762 and weighs just over 3 tonnes. 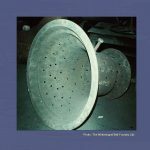 It had never previously been tuned, but was thick enough to be capable of being tuned to a high degree of accuracy. 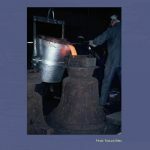 This photograph shows the metal being pared off the soundbow of a bell. 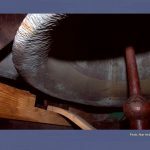 By removing metal from different zones the various partial tones can be brought into tune with each other and the bell tuned to take its place in a ring, chime or carillon. 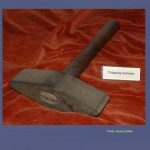 Rather than using a violin or pitch pipe, tuners today employ either calibrated tuning forks or an electronic device to ensure bells are tuned to a high degree of musical accuracy. 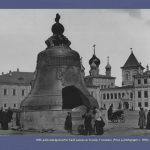 Throughout the centuries, bell founders have always been amongst the most skilled metal technologists, as is demonstrated by Tsar Kolokol, at 195 tonnes the largest bell in the world, which was cast in Moscow in 1735. Unfortunately it was damaged by a fire in 1737 before it could be hung. Since then it has stood on a platform in the Kremlin. The fragment that broke away weighs about 11 tonnes! 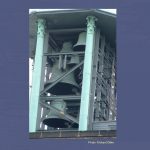 The heaviest harmonically tuned bell in the world is the bourdon bell of the Laura Spelman Rockefeller Memorial Carillon, in the Riverside Church, New York City. 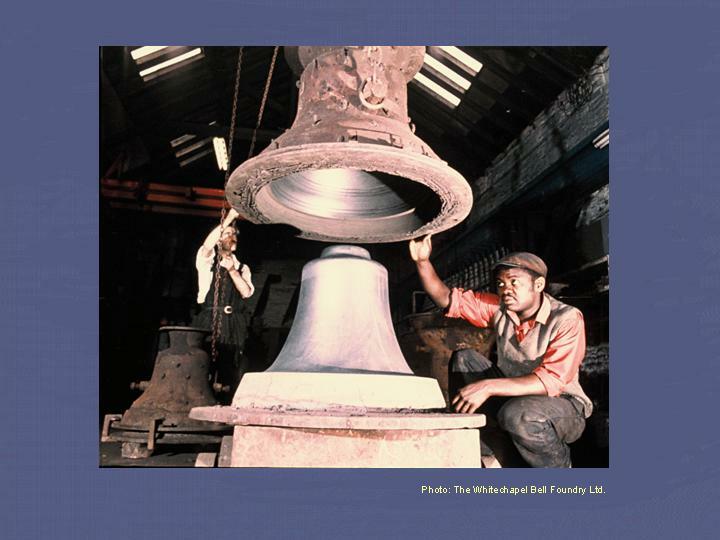 Weighing 18 tonnes, this bell was cast in 1928 by Gillett and Johnston of Croydon. 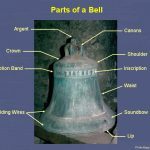 There are a number of different ways in which a bell can be hung and rung. 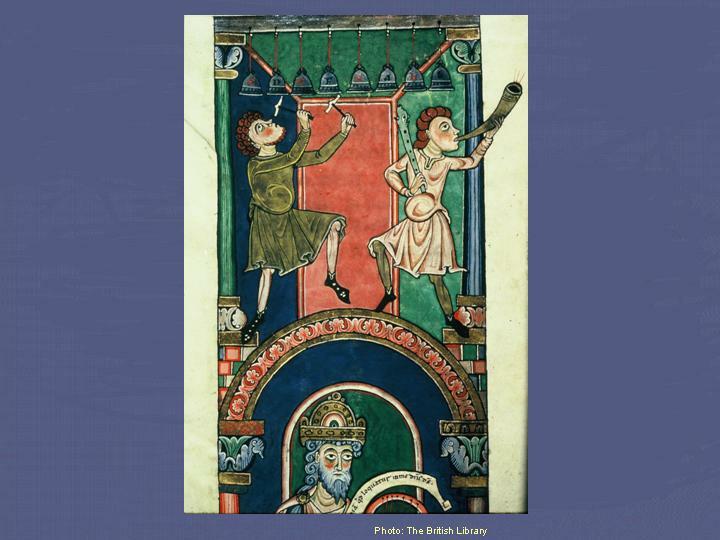 This example, Bell Harry at Canterbury Cathedral, is hung ‘dead’, that is, unable to swing, and is sounded by means of an electro-magnetic hammer. 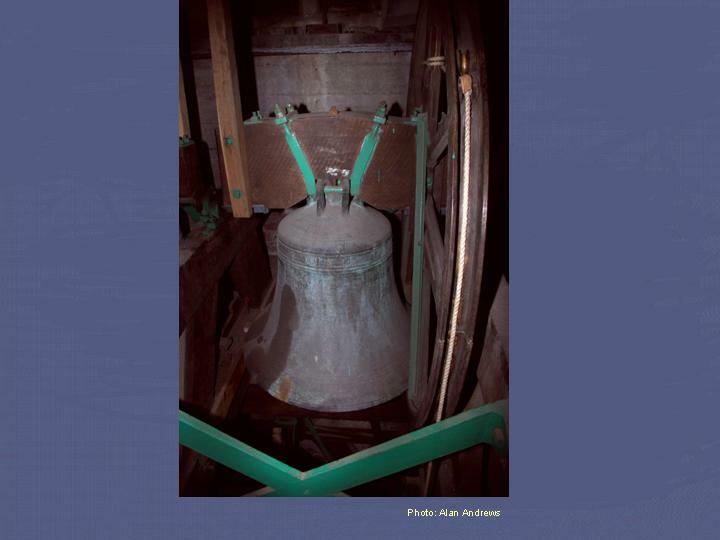 A carillon is a musical instrument of at least 23 bells, hung ‘dead’ and sounded by striking the bell with a mechanically operated clapper. 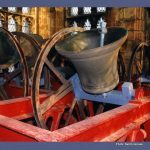 The bells are arranged in a chromatic progression, including the ‘accidentals’, so that music can be played in any key. 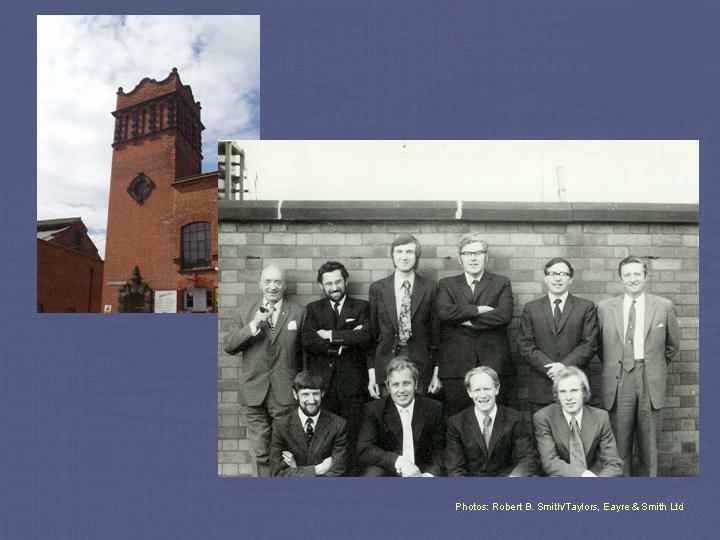 The carillon in this photograph is in the tower at Bournville in Birmingham. 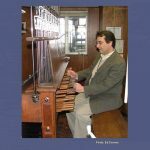 The bell clappers are connected by means of wires and a tracker system to a ‘baton clavier’ that enables the player to control both the rhythm and dynamics of his playing.  Thus the carillon is capable of producing a considerable dynamic range and control of expression through variations of touch. 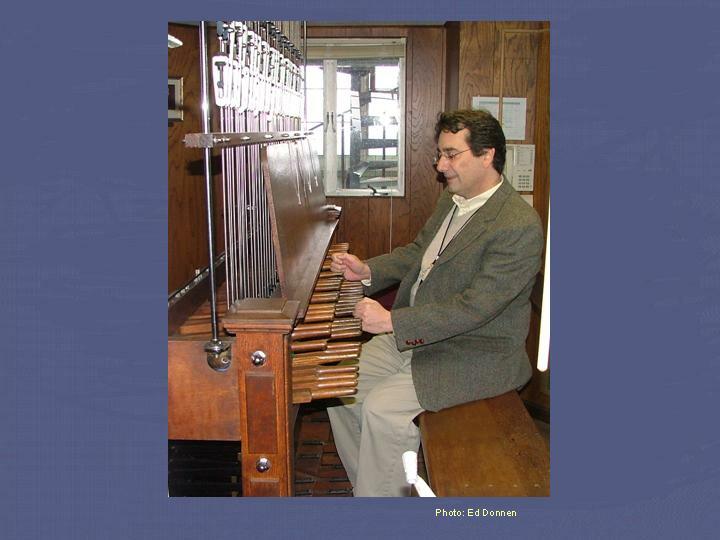 The picture shows Ed Nassor at the clavier of the 54-bell carillon in Washington National Cathedral, USA. Note that the deeper notes are sounded by means of foot pedals similar to those on an organ. 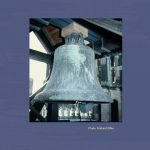 Bells that are sounded by means of swinging, rather than being struck with a hammer, produce a much fuller, richer and louder tone. The simplest method of sounding a bell in this manner is known as ‘swing-chiming’. 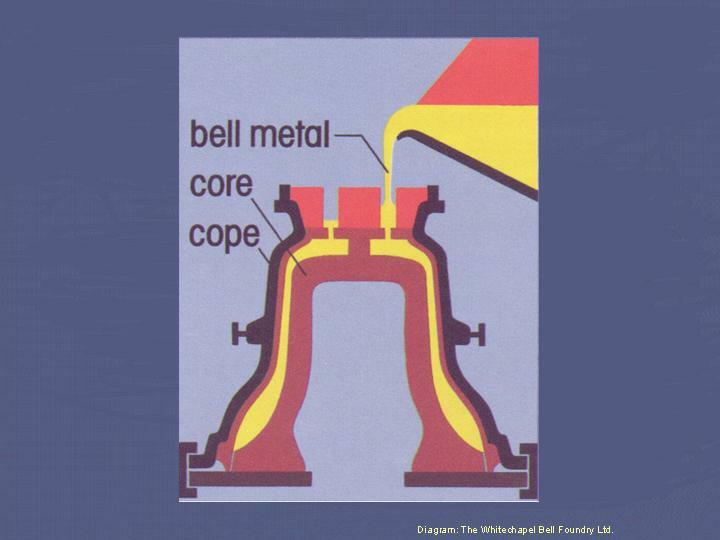 The bell is attached to a beam, or ‘headstock’ which is pivoted at each end. To the headstock is bolted a lever with a rope attached. A free-swinging clapper is suspended inside the bell. 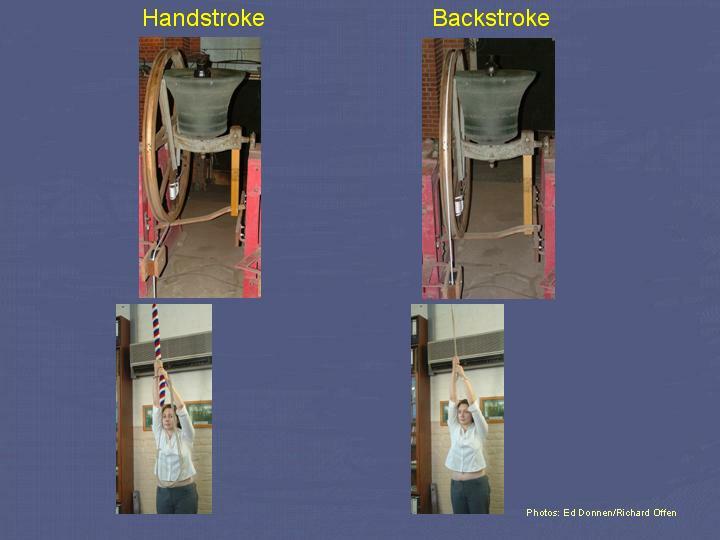 By pulling the rope, the bell is rocked gently from side to side, the movement of this action causing the clapper to strike the bell on one side only. 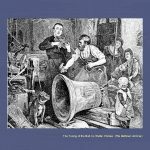 This system of ringing seems to have evolved in England after the Reformation in 1547, but developed fully during the 17th and early 18th centuries. 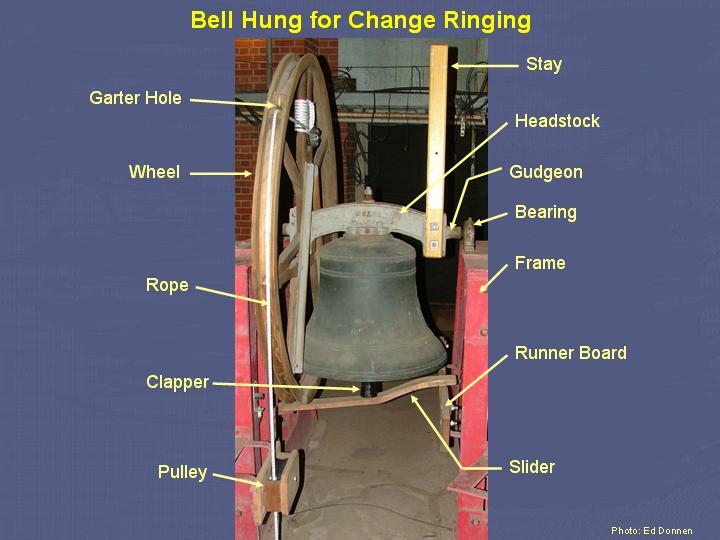 Full-circle ringing provides the ringer with a high degree of control over when the bell strikes. 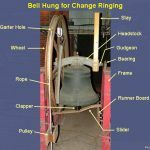 This is necessary in order to ring a set of bells accurately in a sequence of predetermined orders – known as ‘change ringing’. 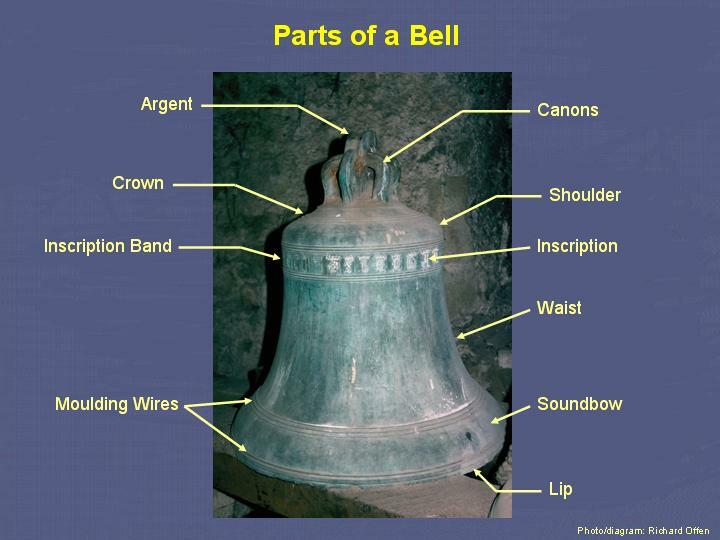 The bell in this diagram is hung for full-circle ringing. 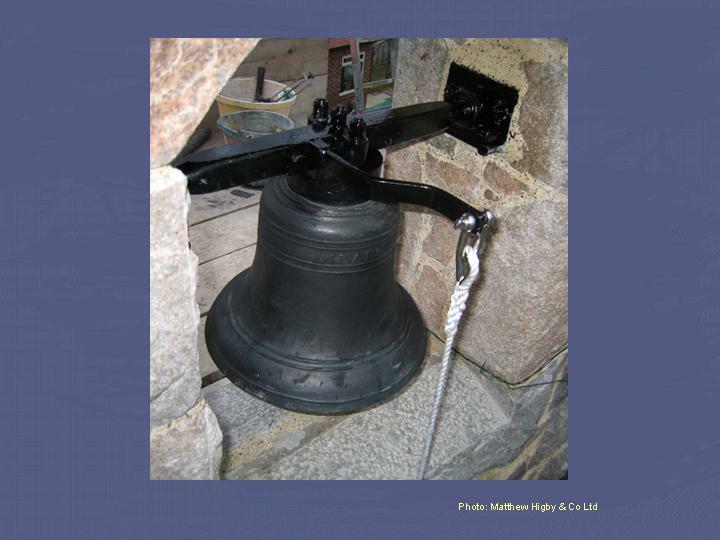 That is, the bell is hung so that it can rotate through 360° and it is fitted with a wheel and rope. 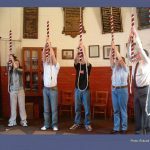 The bell starts in the ‘mouth down’ position and has to be rung ‘up’ before ringing can commence. The ringer does this by pulling the rope repeatedly, gradually making the bell swing higher and higher until it rotates through a full circle every time the rope is pulled. Once this operation is complete the bell turns one complete circle at each pull of the rope, from mouth up to mouth up and then back the other way, the bell striking once near the end of each revolution. The bells in this photograph are the ring of 16 (one of only three rings of 16 in the world) at Swan Bells, Perth, Western Australia. They are shown at rest in the ‘up’ position, having been ‘set’ just past the balance with their stays resting against their sliders. 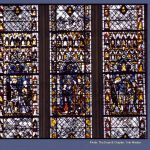 The 8 bells of Howden Minster, East Yorkshire – tenor 22-1-3 in E-flat – while being rung full-circle. 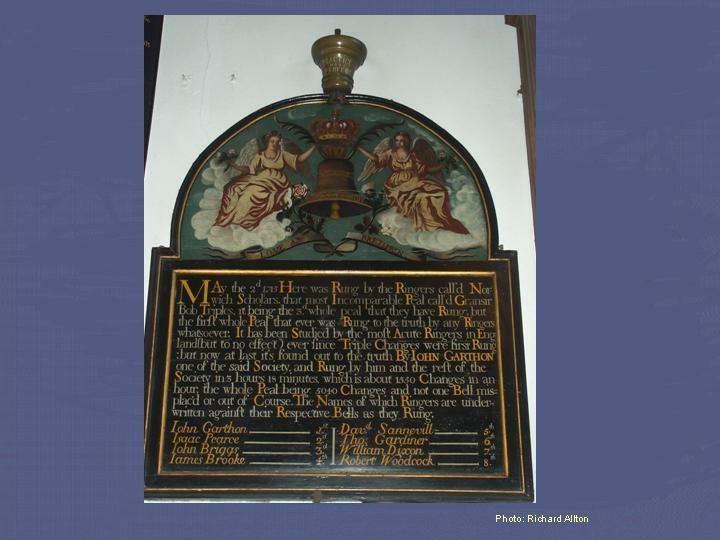 Ringers at St Chad’s, Shrewsbury, Shropshire. 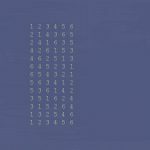 ‘Rounds’ can be represented numerically, starting with the bell with the highest note as number one. Simply ringing rounds becomes monotonous after a while. 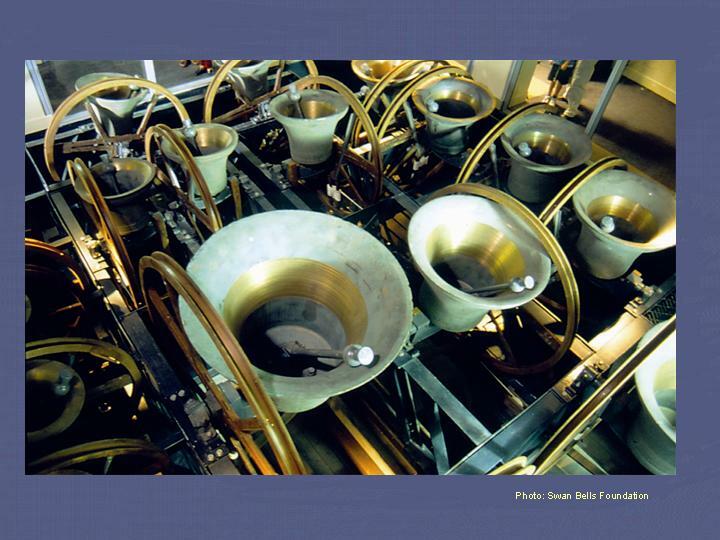 To break this up, the order in which the bells sound can be varied, but because of the physical constraints of the bell’s mechanism, each bell can only be moved one place at a time in the sequence. 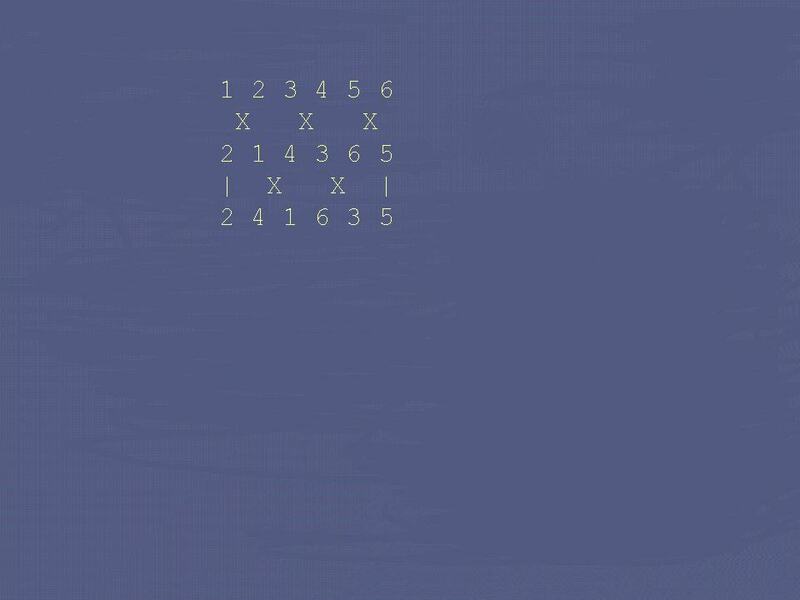 By swapping the three pairs of bells in rounds on six (1-2, 3-4 and 5-6), a row with a different sequence is created. 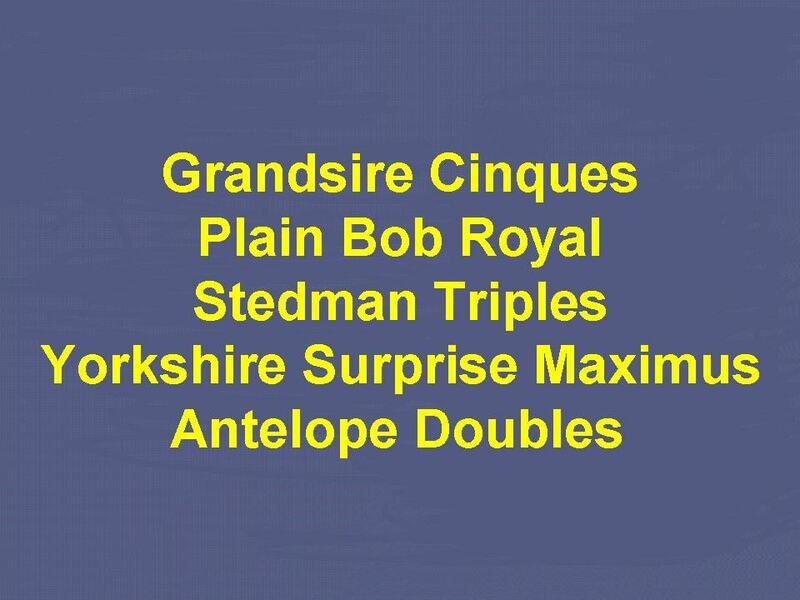 Swapping the pairs back again would result in a return to rounds. 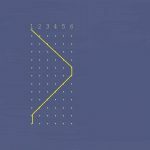 Therefore, to create a new row, the bells sounding first and last in the sequence remain ringing in the same positions and the two middle pairs are swapped instead. 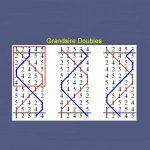 By alternately swapping three then two pairs as above, twelve ‘changes’ can be executed, one after the other, before returning to rounds. 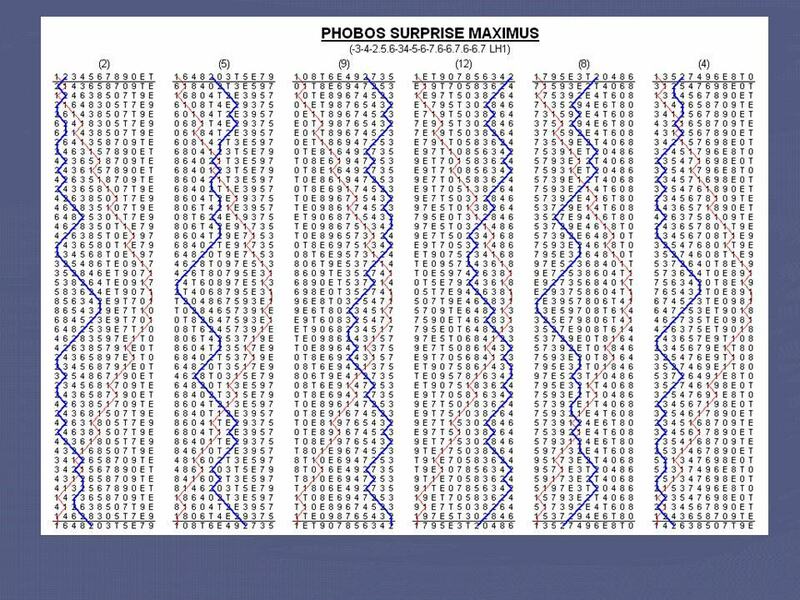 By ringing these rows, or ‘changes’, in succession, changing the order at each pull of the rope, the pattern of sound is varied and the most basic form of ‘change ringing’ is achieved. 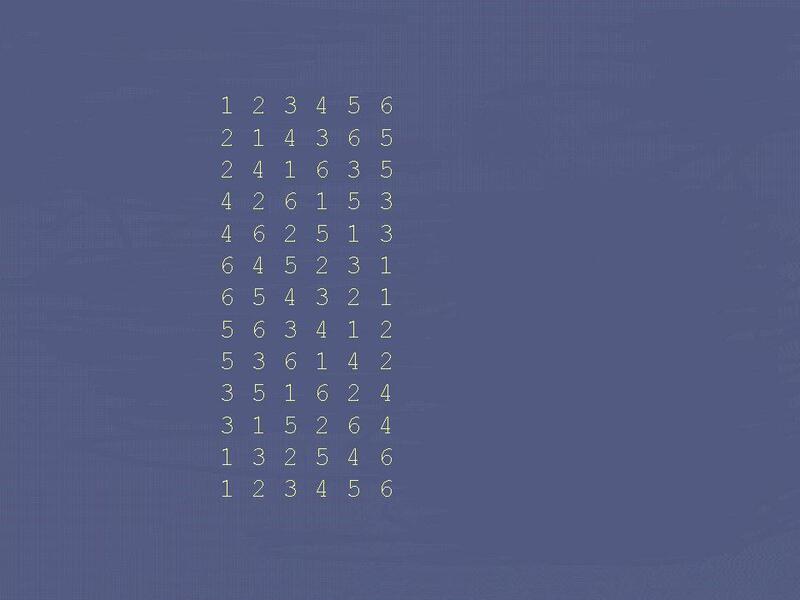 Each row is similar to a bar of music. Every bell must ring once only (at the same stroke as the rest) and can only ring again when all the bells have rung for that stroke. 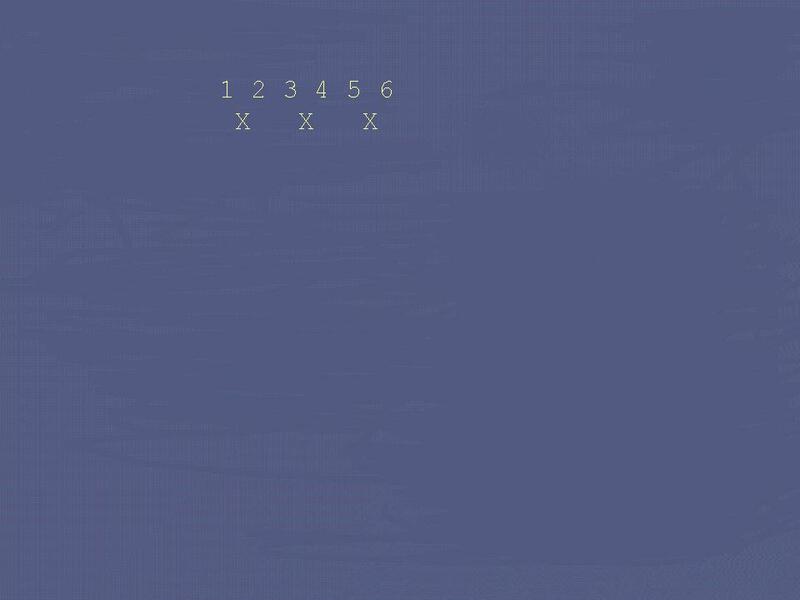 This pattern shows the most basic change ringing ‘method’ – analogous to a tune in conventional music – known as Plain Hunt or Original.  Method ringing requires each ringer to learn the pattern of successive changes. 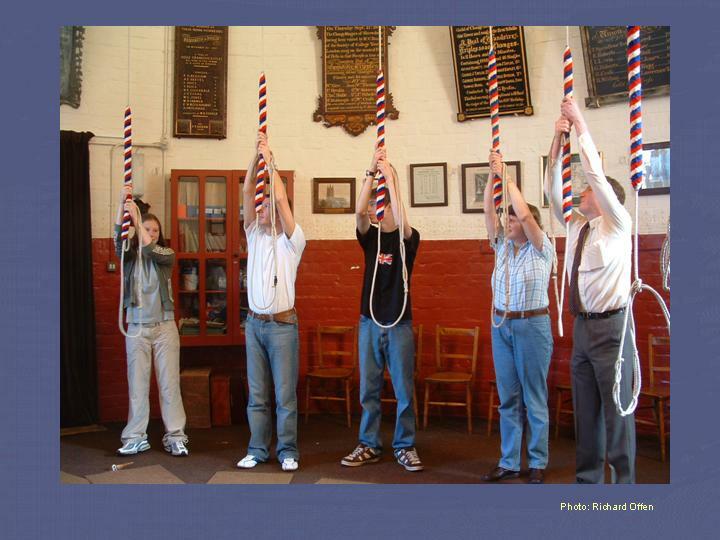 This is made even more challenging because, by tradition, no visual aids are allowed whilst ringing. 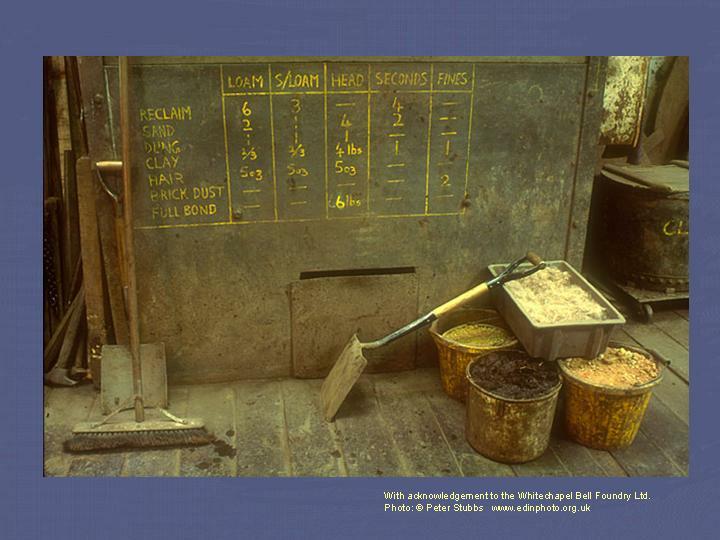 The simplest method, shown in these diagrams, is known as “Plain Hunt”, in which each bell “hunts” from the leading position to the last position and back again. 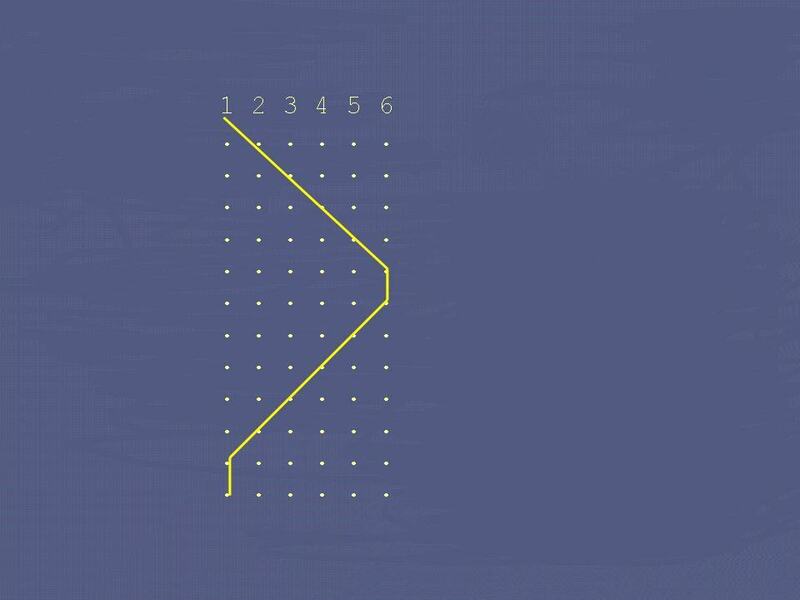 By superimposing a graph line over the path of one bell (No 1 in the diagram), the ringer can trace the position of his bell in the sound pattern relative to all the others. 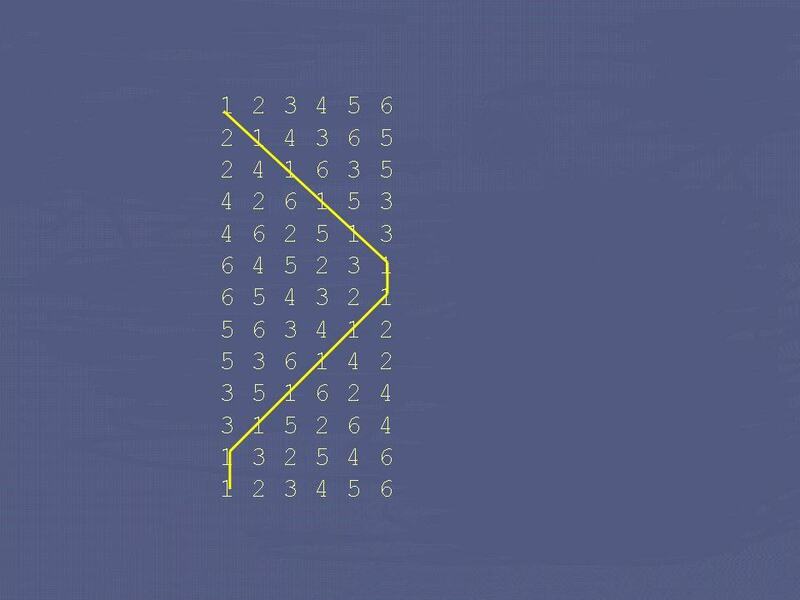 By memorising this graph, the ringer has no need to memorise row upon row of complicated number patterns. 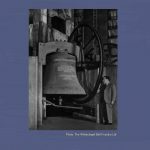 The ultimate goal of method ringing is to ring the bells in every possible order without repeating a row. 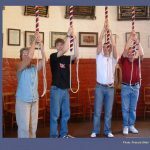 In order to achieve this, ringers have devised ‘methods’, which are methodical systems of changing the order in which the bells are rung each time the ropes are pulled. 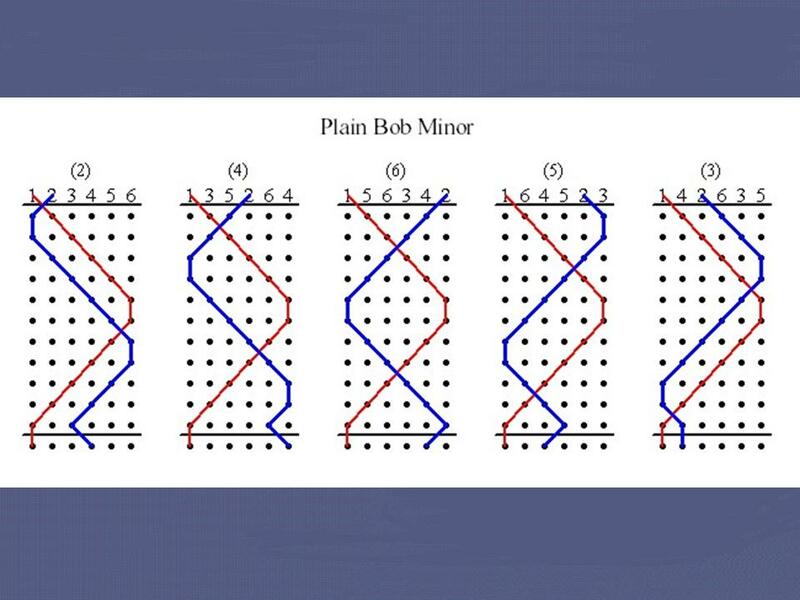 Plain Bob Minor, rung on six bells, is shown in this diagram. Methods are the building blocks of change ringing. 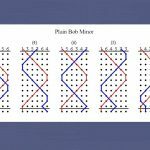 When ringing a method the bells begin in rounds, ring changes according to the pattern set out in the method and return to rounds without repeating any row along the way. 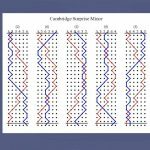 These changes produce musical patterns, with the sounds of the bells weaving in and out of each other. 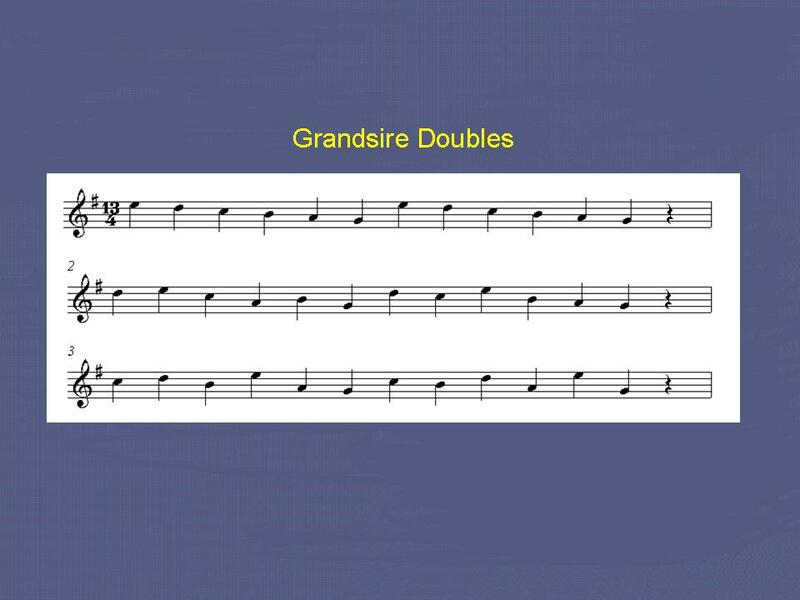 This method is known as Grandsire Doubles, which is rung on five bells, usually with a sixth bell, the heaviest of the ring – known as the Tenor, sounding at the end of each row. 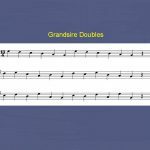 The first few rows of Grandsire Doubles look like this in musical stave notation. 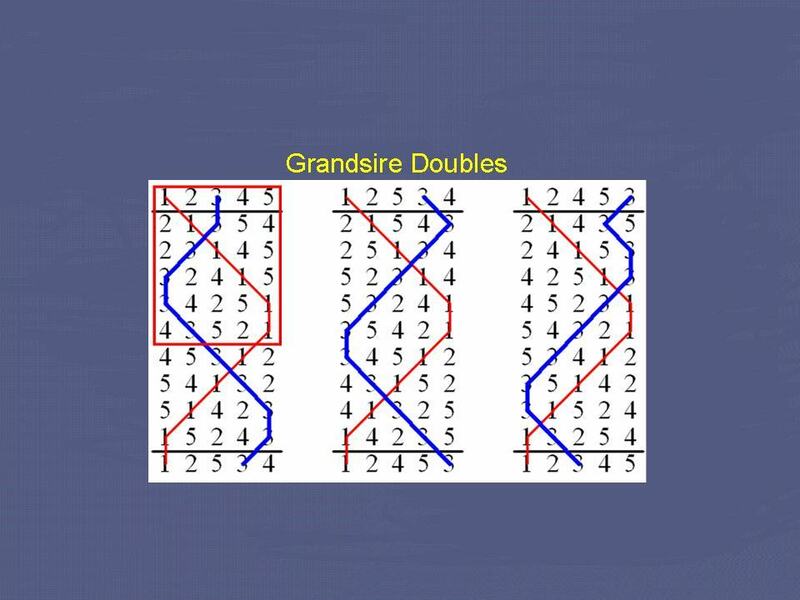 The quarter rest at the end of each line depicts the customary ‘open handstroke lead’ used by most change ringers. 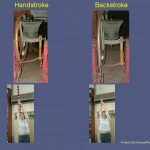 This is achieved by all of the ringers slightly delaying each handstroke pull. 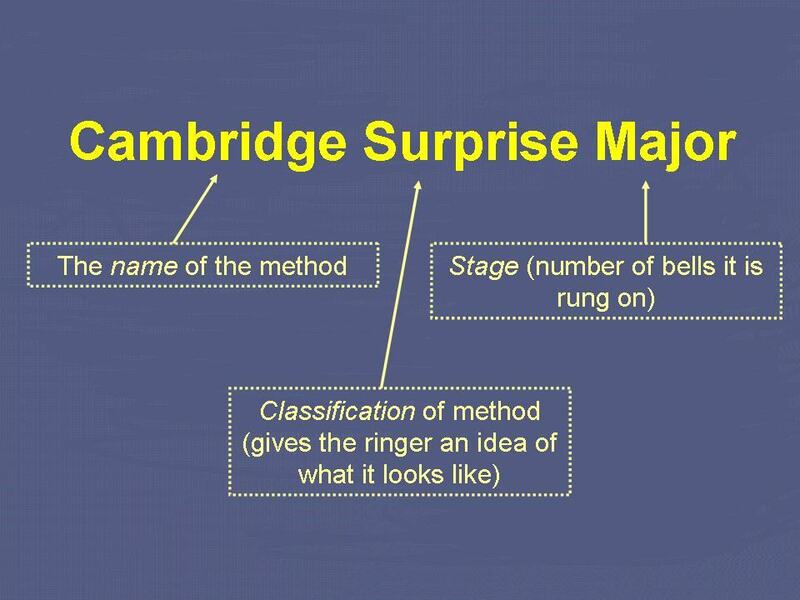 Many more complex methods have been devised which provide more extensive sequences of changes before returning to Rounds. 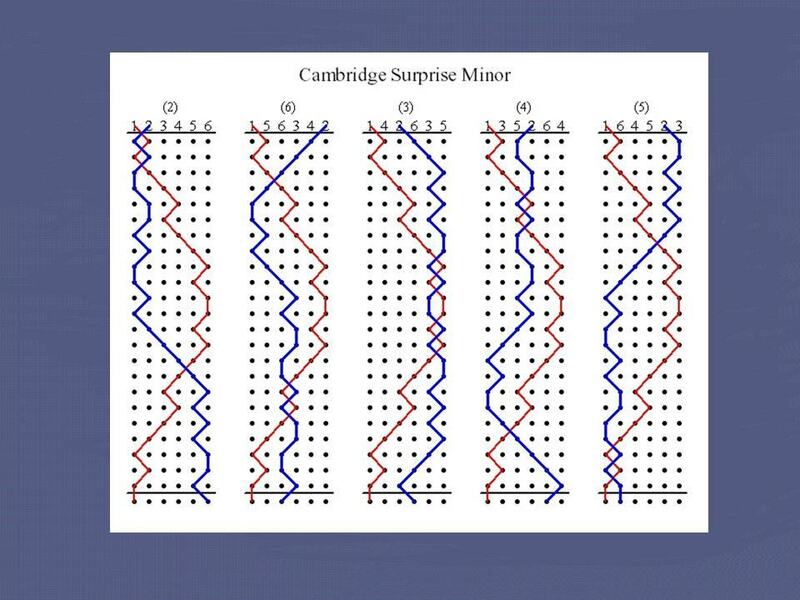 This example shows Cambridge Surprise Minor, rung on six bells. The diagrams for rather more complex and challenging methods, such as this one rung on twelve bells, often resemble the ECG trace for someone who has gone into cardiac arrest, and take a considerable amount of brain power to learn and ring. Each method has a “basis” to the way it is constructed. 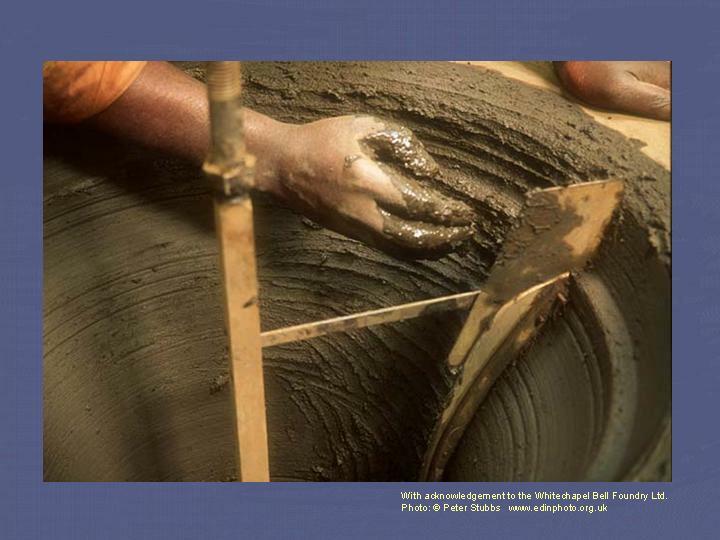 This creates various “classes” of methods that share common aspects of construction. 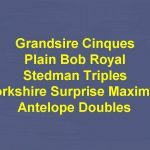 Methods are referred to in full by their name, class (the type of line one can expect to see) and stage – the number of bells on which they are being rung. Individual methods are often named after places (e.g. Kent, London), or after the person who invented them (e.g. Stedman, Annable’s London). This can lead to some very eccentric names! 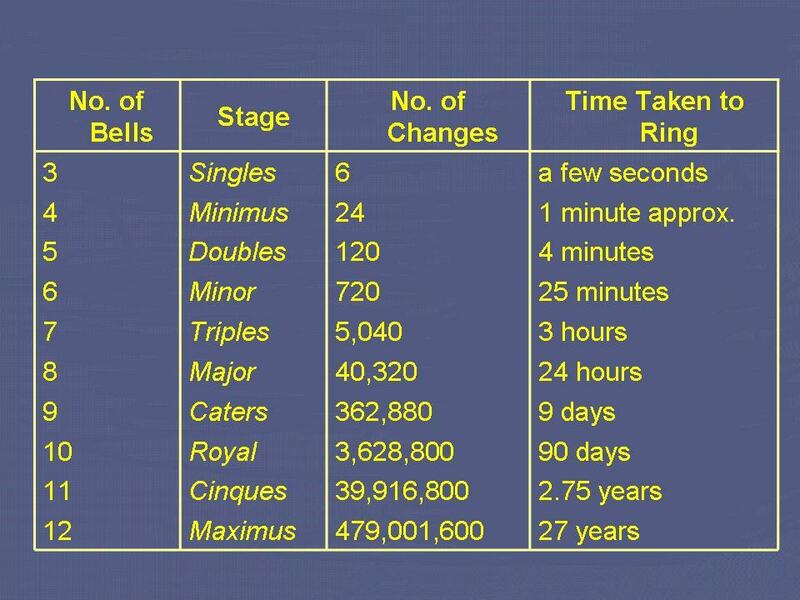 The table on this slide shows the number of changes possible without repetition on each number of bells. 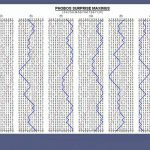 In this table the time take to ring each set of changes has been calculated assuming that the changes are rung at a rate of 24 changes per minute. 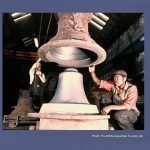 The longest peal ever on tower bells was rung at Taylors bell foundry, Loughborough, UK on 27 July 1963, consisting of all 40,320 changes possible on eight bells, in just under 18 hours. The rate of striking was 37 1/3 changes per minute. 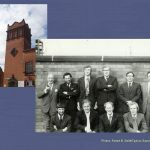 The Extent on 8 bells was also the record length overall until 2 October 2004, in Coventry, when Philip Earis, Andrew Tibbits and David Pipe rang 50,400 changes (10 times the length of a standard peal) in 70 different Treble Dodging Minor methods on handbells in just over 17 hours – a striking rate of almost 50 changes per minute. An even more impressive feat of endurance and concentration, but at least they didn’t have to stand up all the time! 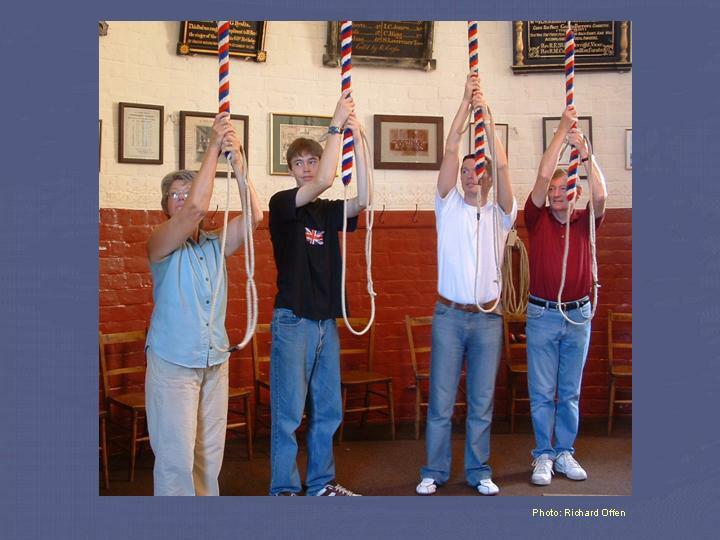 The lightest ring of bells hung in a church are the six bells at St Christopher’s, Warden Hill, Gloucestershire. The largest of these weighs just over 1/2 cwt. The largest bell in the world hung for change ringing is the tenor of the ring in Liverpool Cathedral. 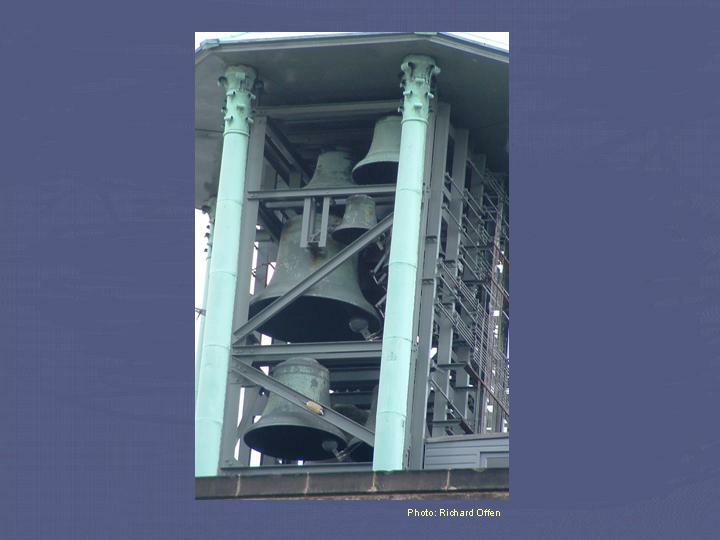 The thirteen bells, including a sharp 2nd are named the Bartlett bells after Thomas Bartlett who donated the cost of the ring, and have a total weight of 16½ tons, with the tenor weighing just over 82 cwt. 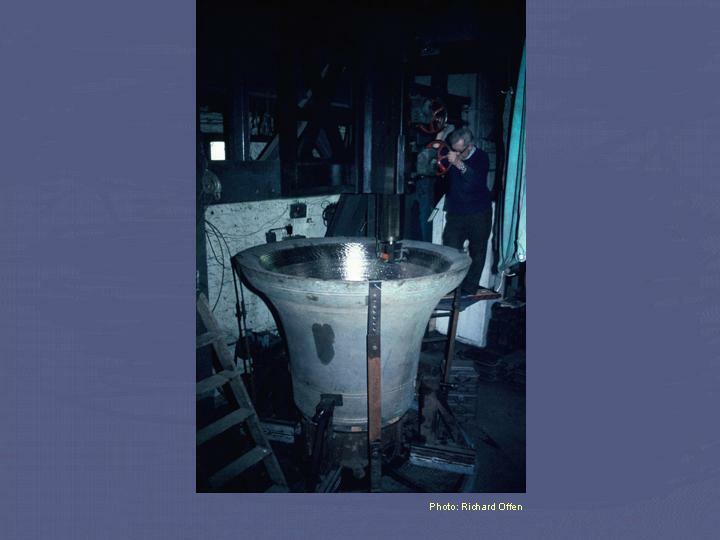 The bells were cast in 1939 at the Whitechapel Bell Foundry, London, and the photograph shows Albert Hughes, then proprietor of the foundry, standing next to ‘Emmanuel’, the tenor bell. The initial letters of the inscriptions on the ring spell out the donor’s name “Thomas Bartlett”. The vast central tower of Liverpool Cathedral rises to 331 feet from floor level and measures 90 feet square at its internal base. 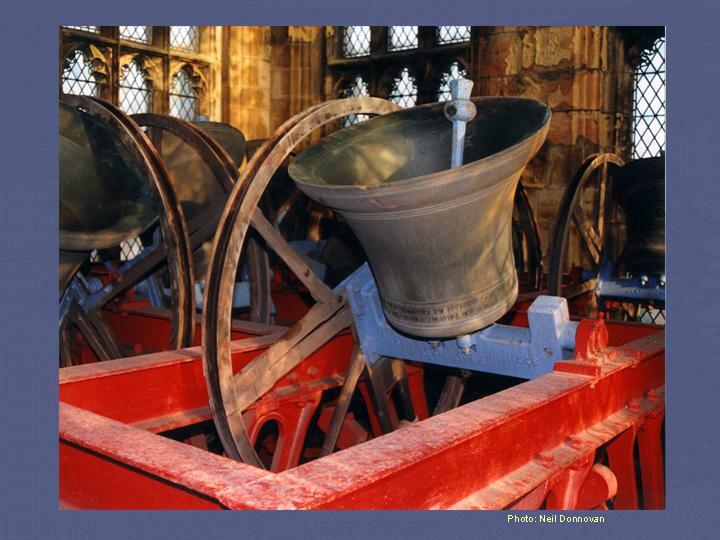 The bells, which are the largest ringing peal of bells in the world, are hung in a concrete radial frame surrounding the bourdon bell, Great George, which weighs almost 15 tons. 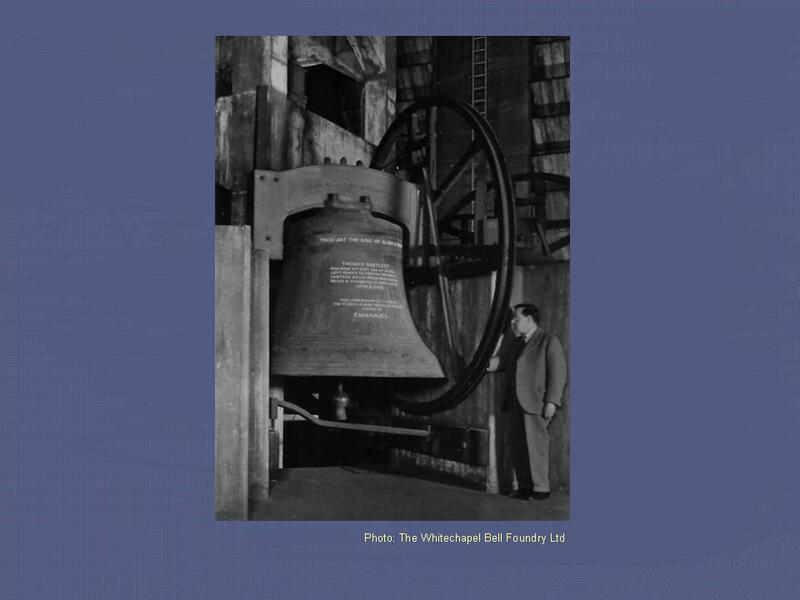 The bell frame is unique not only for being the first ever radial bell frame (designed to minimise the effect of horizontal forces generated by change ringing bells), but also the only bell frame constructed entirely of reinforced concrete. 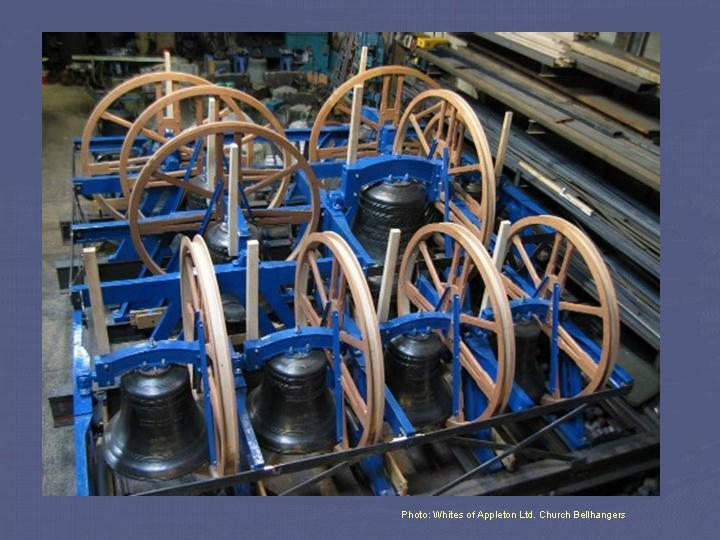 The new ring of ten bells for St Helen’s Church, Abingdon, Oxfordshire, set up for testing in the workshops of Whites of Appleton Ltd. 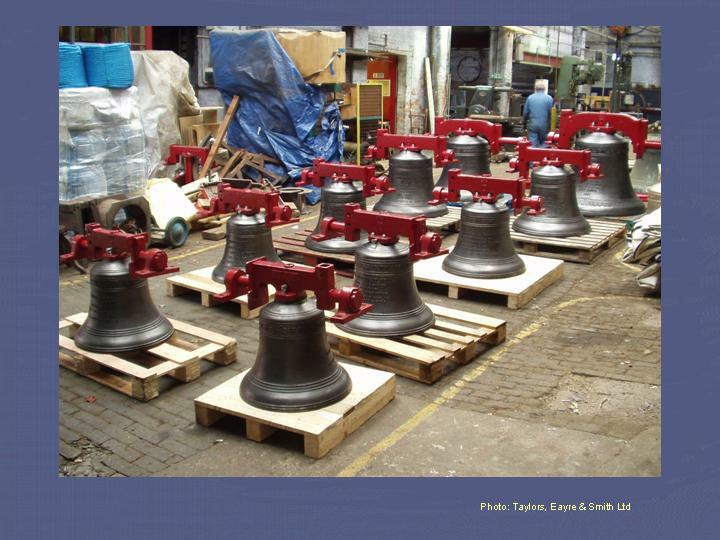 The new ring of ten bells for St Paul’s, Birmingham awaiting shipment from the Taylors, Eayre and Smith workshops in Loughborough. The oldest bell hung for change ringing and still in regular use Sunday by Sunday, is thought to be the fifth bell at St Dunstan’s Church, Canterbury, Kent. 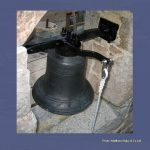 It was cast in about 1325 by William le Belyetere, a local bell founder. 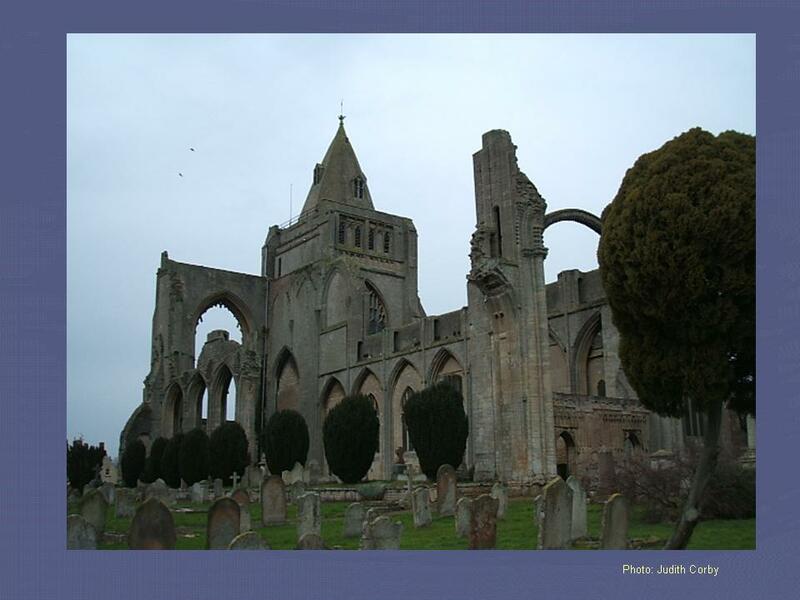 The original bells of Crowland Abbey are said to have been the first tuned ring in England. 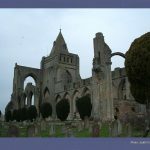 In the early tenth century Abbot Turketyl had a great bell cast for the Abbey, called Guthlac. 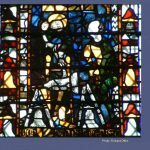 Egelric (Abbot 975-984) added six more to complete the tuned peal; they were named Bartholomew, Beccelm, Turketyl, Tatwin, Pega and Bega. 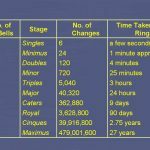 The tenor of the current ring of 6 dates from c1499 and the front 5 date from 1788 through 1903. 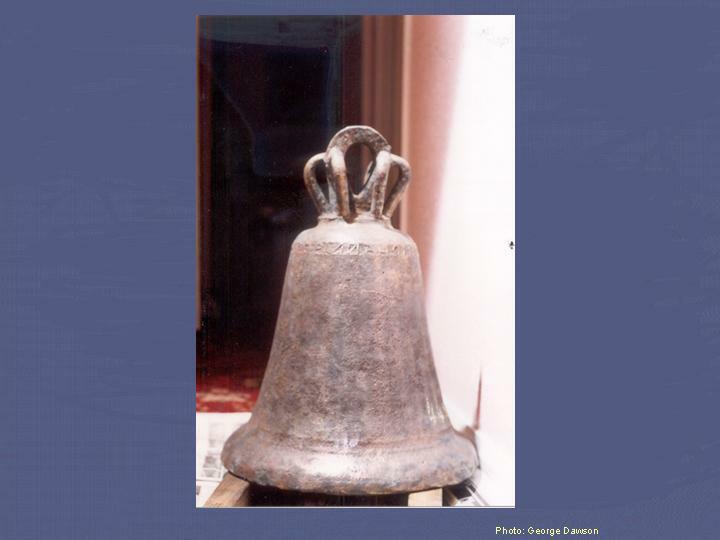 Bells can be extremely long-lasting artefacts. 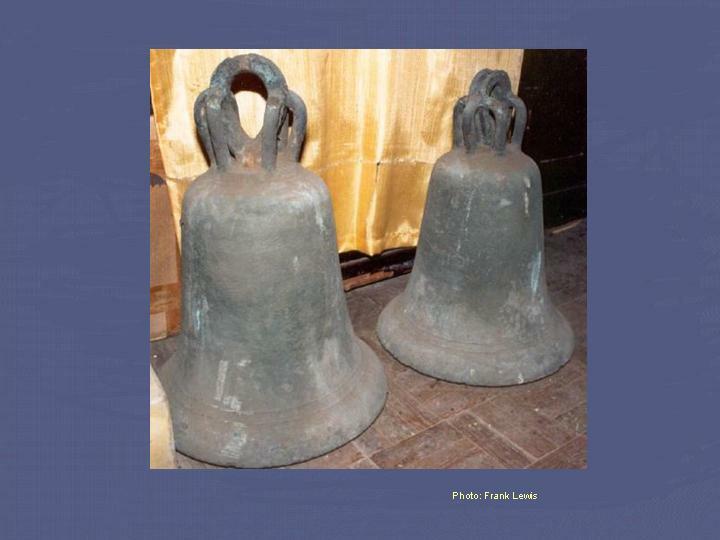 From about the 12th century comes this pair of bells at Iwade, a small village in Kent. 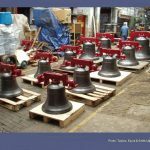 These bells have been in continuous use since they were installed almost nine hundred years ago and have recently been rehung to ensure their continued service. Even more rare are bells from this period that are inscribed with the year of their manufacture. It is generally agreed that the earliest example of a dated bell in the UK is that at Lissett in East Yorkshire. This bell is inscribed with the date 1254. 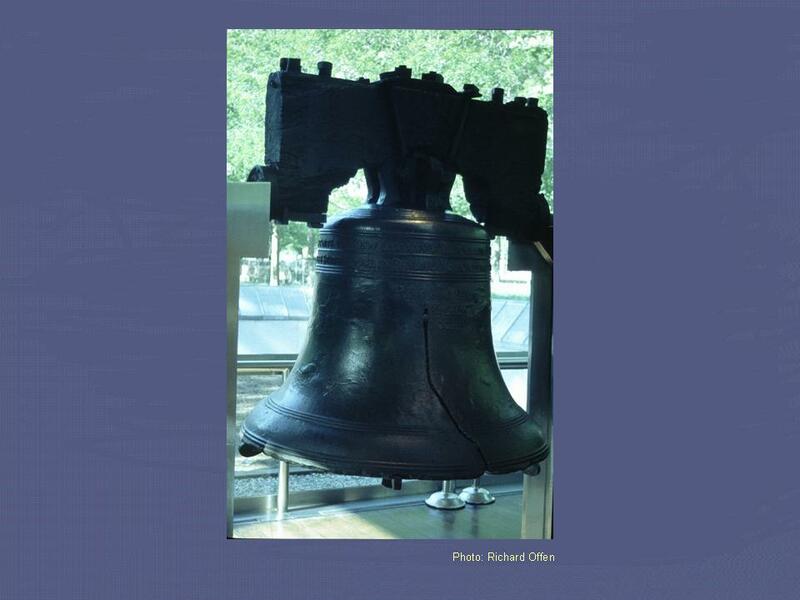 The Liberty Bell is probably one of the best known bells in the world. 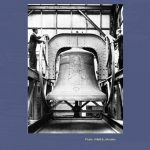 It was originally cast in 1752 at the Whitechapel Bell Foundry, London, by Thomas Lester to commemorate the 50th year of the existence of the State of Pennsylvania. After a stormy, eleven-week Atlantic crossing, it was cracked whilst being hung and tested in the tower of the Philadelphia State House. 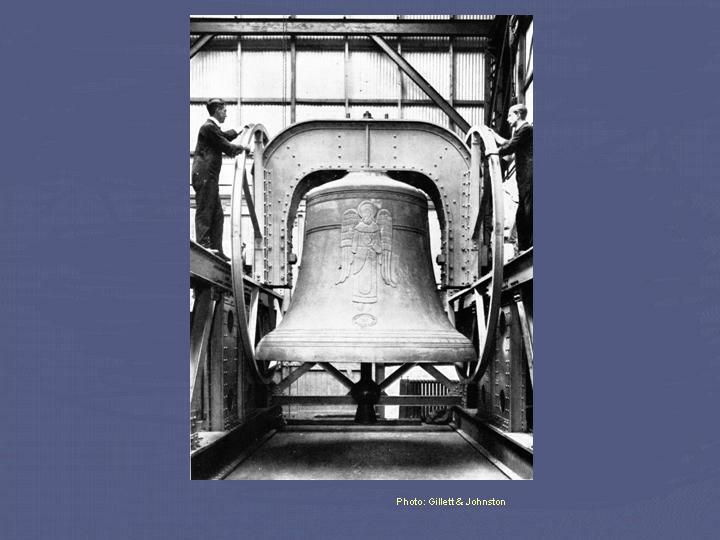 The bell was recast by John Pass and John Stow of Philadelphia, whose names appear on the new bell. 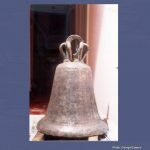 Pass and Stow, who were not bell founders, added too much copper to the metal used to recast the bell and its tone proved to be unsatisfactory. 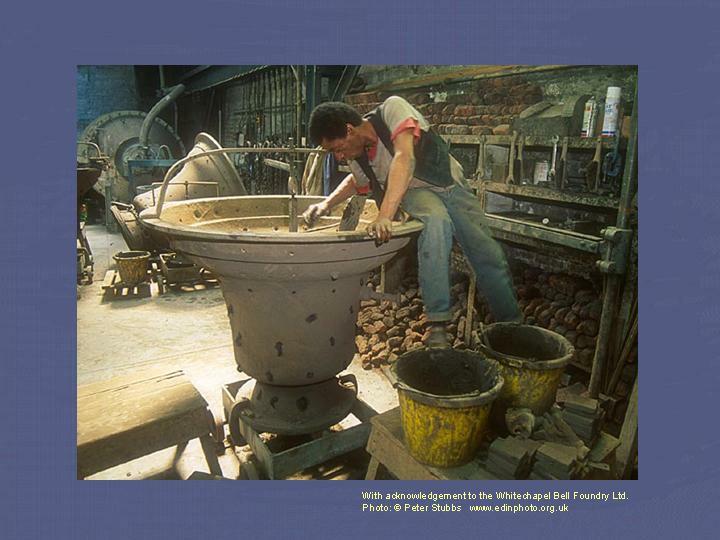 The same founders recast it again, this time restoring the correct balance of copper and tin. 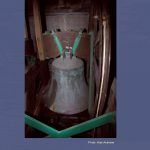 Although the new bell did not wholly satisfy the Superintendents of the Pennsylvania Assembly, it was hung in the steeple of the State House in June 1753 and was the bell which became famous as the Liberty Bell by ringing to proclaim the Declaration of Independence on 4th July, 1776. 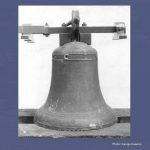 The recast bell cracked in 1835. 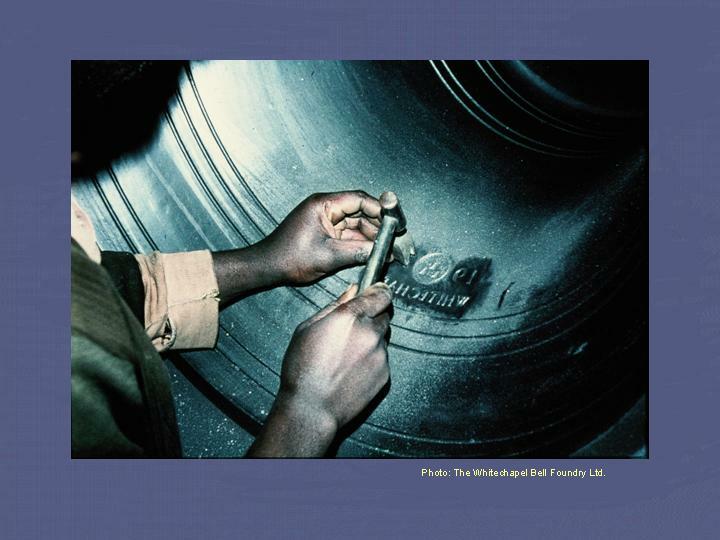 Rather than recast it yet again, an attempt was made to repair it by drilling a slot along the line of the crack to prevent the two sides from vibrating against each other. Two rivets were then inserted in the slot to try and restore the bell’s tone. 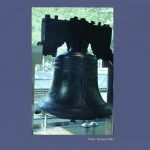 Today, the Liberty Bell hangs on display in the Liberty Bell Pavilion, opposite Independence Hall in Philadelphia, and is still gently rung on 4th July each year. 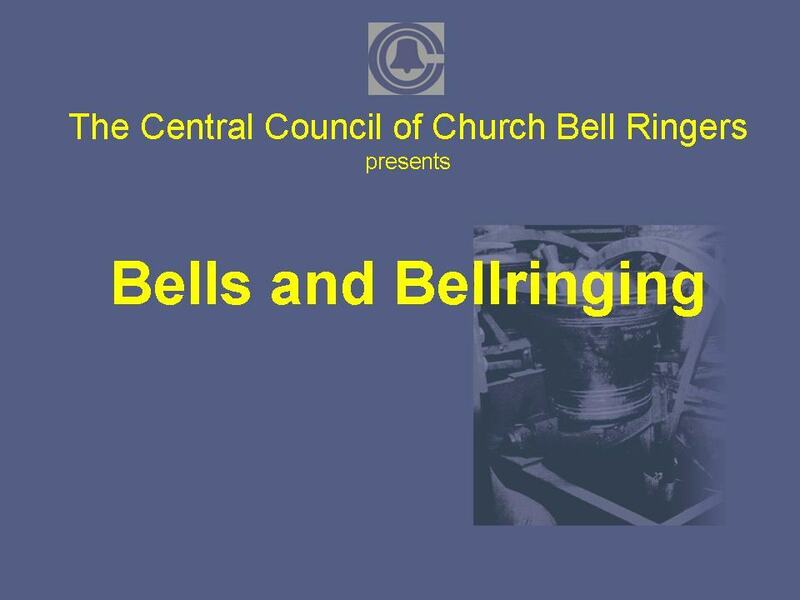 A ring of bells is sometimes referred to as a “peal”, but, more correctly, a peal is long piece of bell music consisting of 5,000 or more changes. 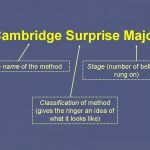 One of the self-imposed objectives of method ringers is to ring a peal. 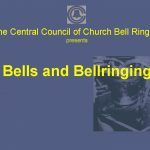 The rules agreed by the Central Council of Church Bell Ringers, state that a peal should be rung continuously, without breaks, and by the same team of ringers throughout. 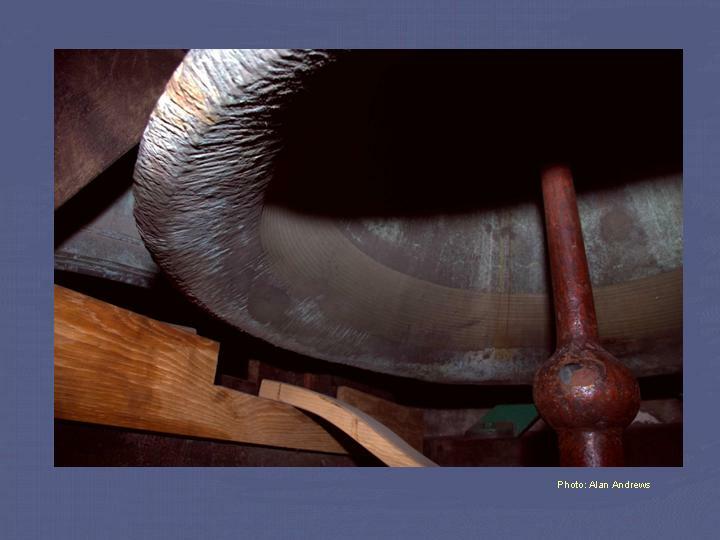 The traditional length for a peal is related to the maximum number of changes possible on seven bells (5,040), which takes approximately three hours to ring. 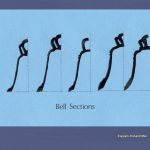 On seven or more bells, no repetitions of changes are permitted during the course of a peal and on lesser numbers only the minimum number of repeats are allowed. 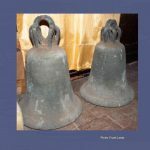 The first recorded complete peal was of Plain Bob Triples (rung on eight bells, seven bells performing the changes and the tenor, or largest bell, ringing at the end of each change “covering”), rung at St Peter Mancroft Church, Norwich on 2nd May, 1715. 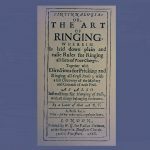 During the late seventeenth and early eighteenth century, ringers began to form themselves into organised companies. 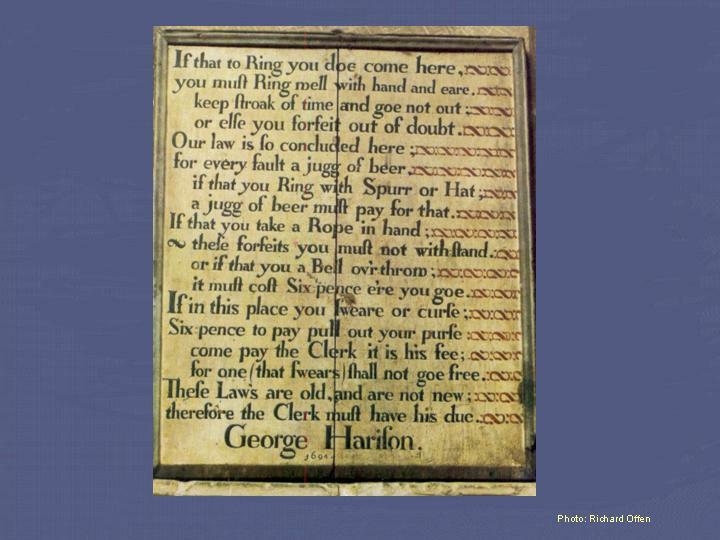 Many of these groups had extremely elaborate codes of conduct, often written in doggerel and painted on boards hung in their ringing rooms. 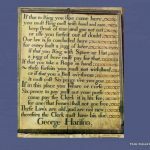 The set depicted here dates from 1694 and dictates, in delightful rhyme, the manner in which the ringers at Tong in Shropshire should behave. 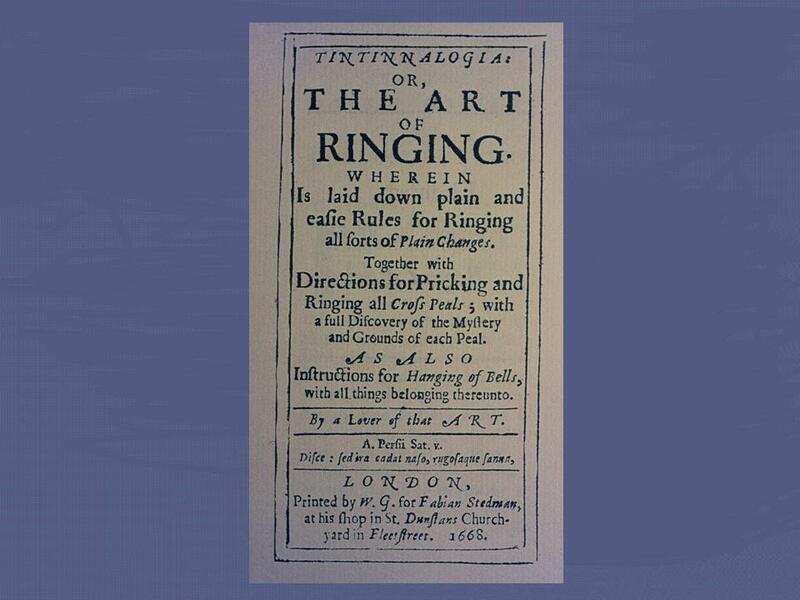 The first text book written on change ringing, Tintinnalogia, was published in 1668 and contains many sets of changes still rung today. See the full text of the 1671 edition of Tittinnalogia courtesy of Project Gutenberg. 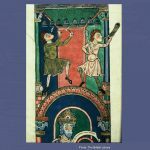 The Worms Bible was written in 1148 at the monastery of Frankenthal in the Rhineland, near Worms. It is a large Bible, over half a metre tall, preserved in two volumes. Its pages are littered with illuminations, including this one showing a musician playing a set of bells. 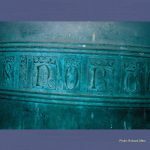 The letters written on each bell, clearly show that by the twelfth century bell founders were capable of producing bells tuned to a musical scale.